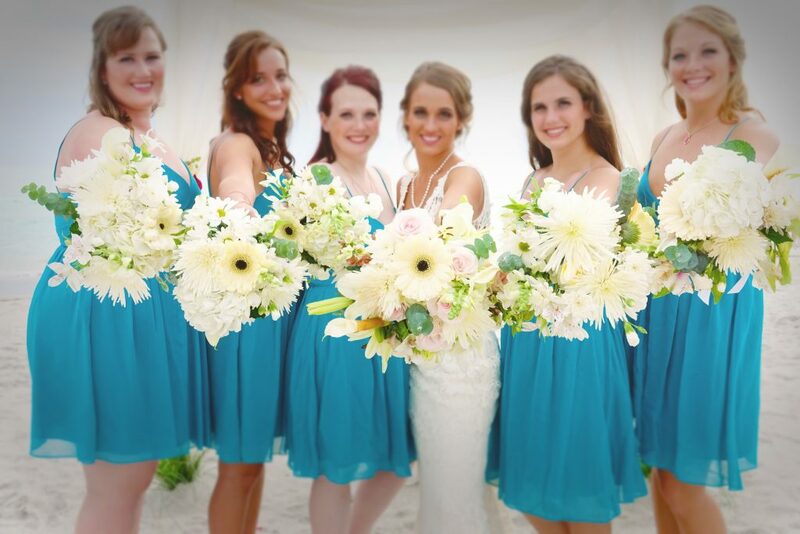 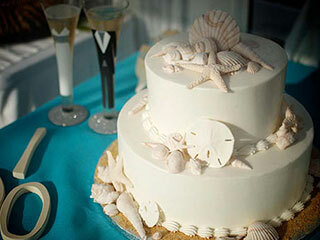 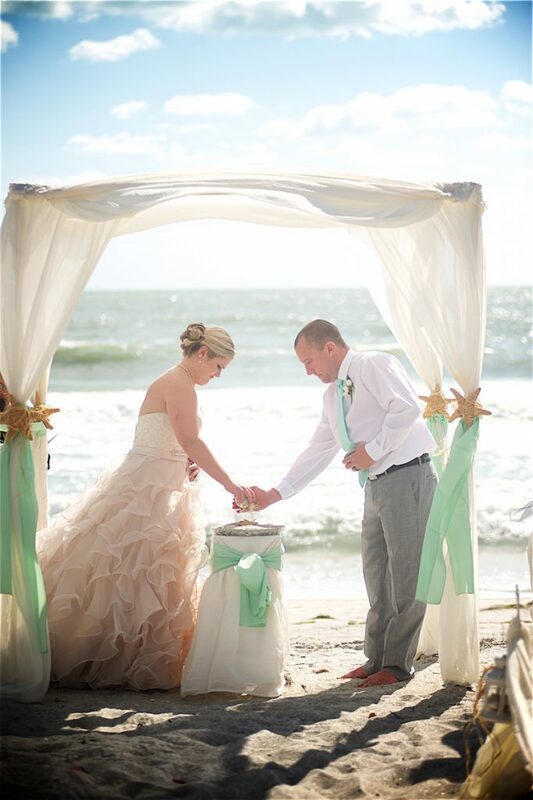 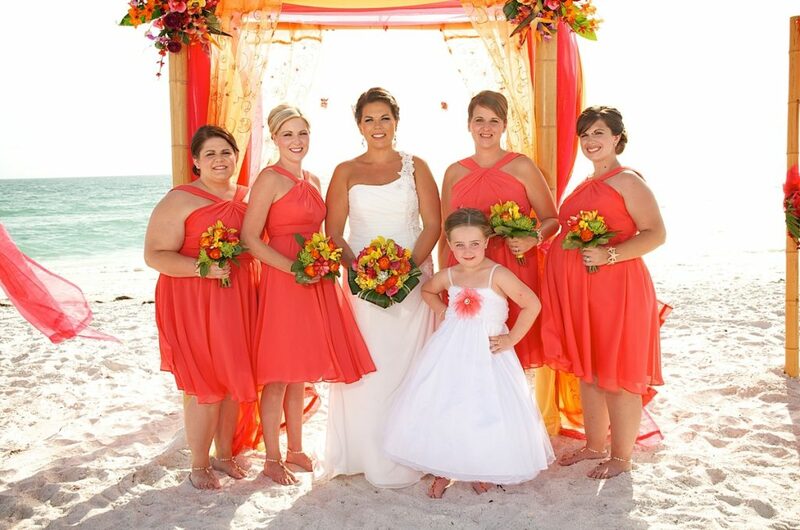 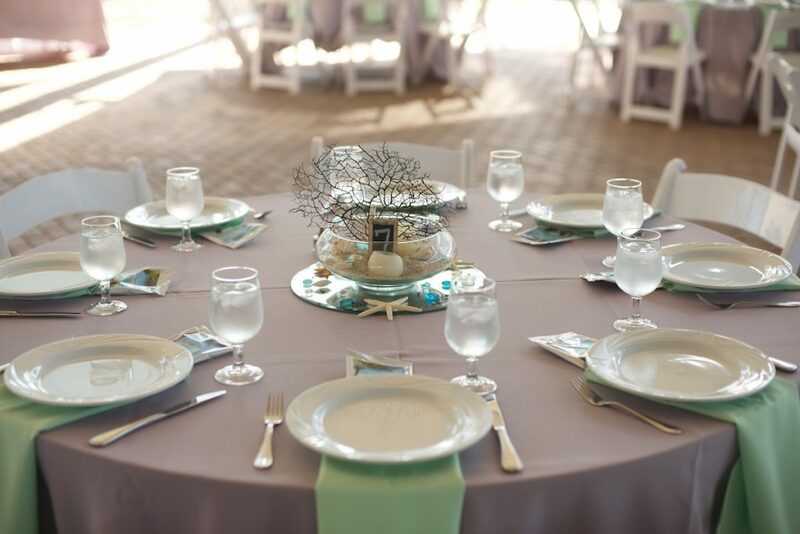 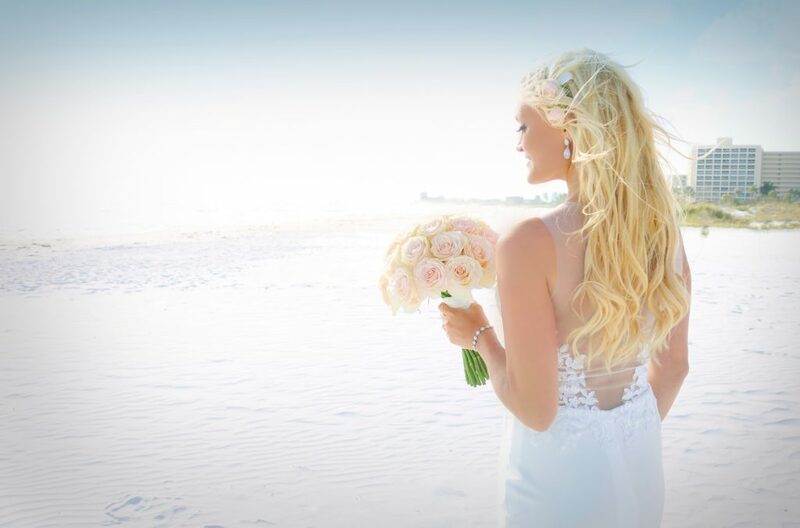 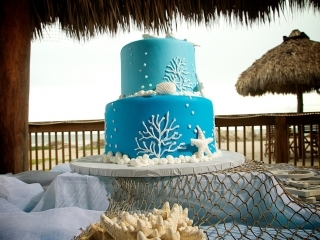 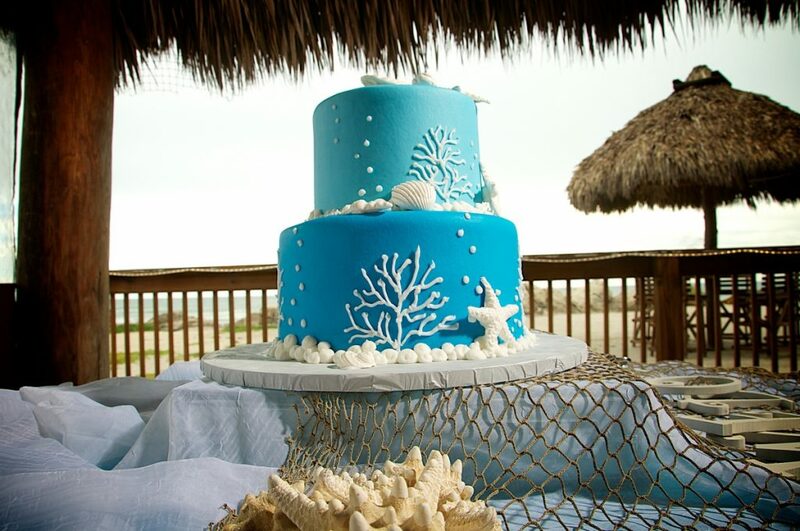 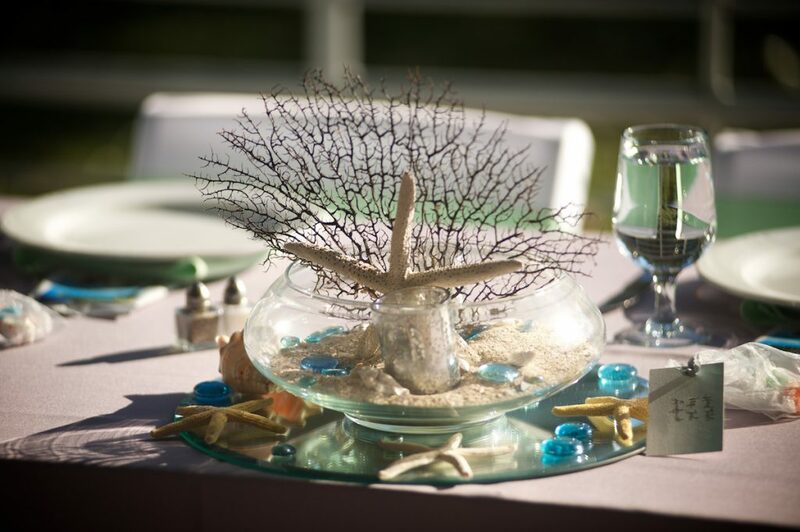 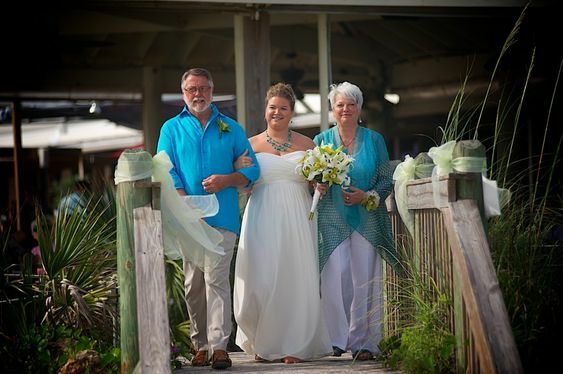 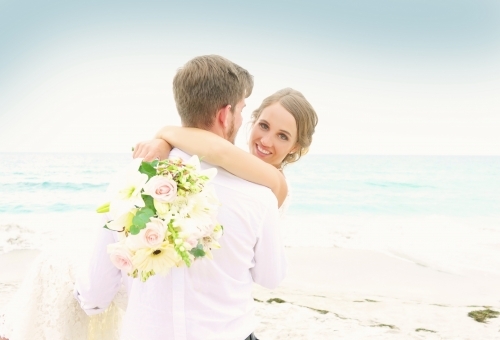 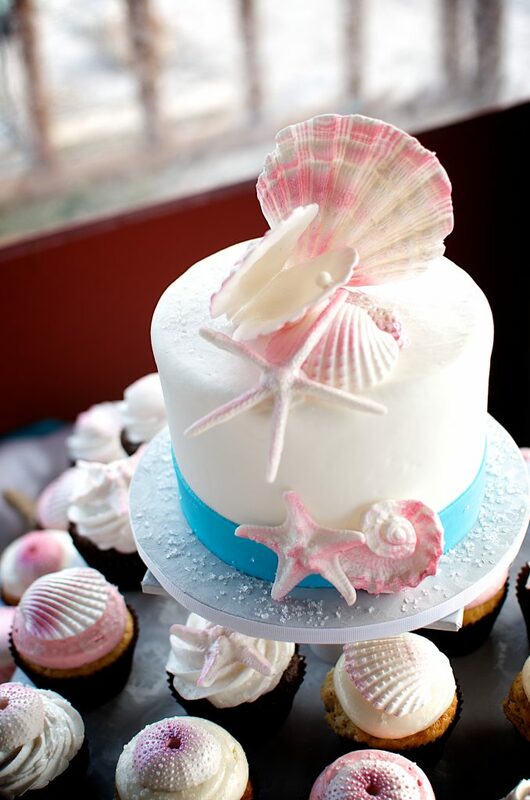 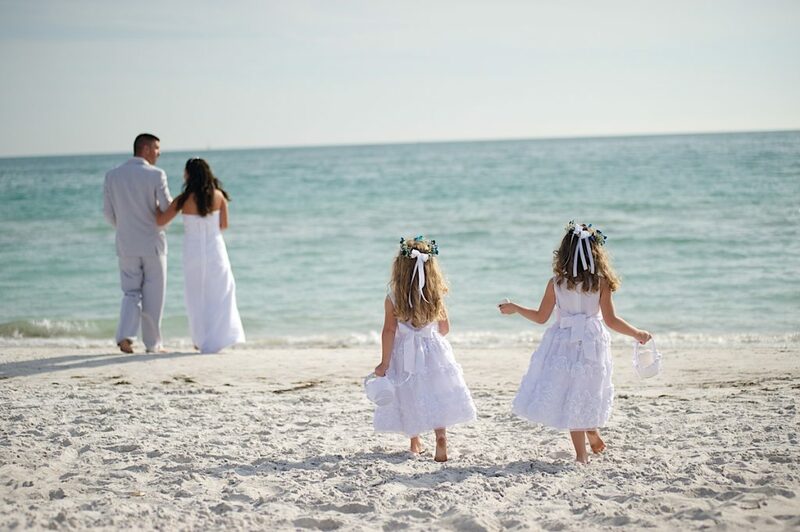 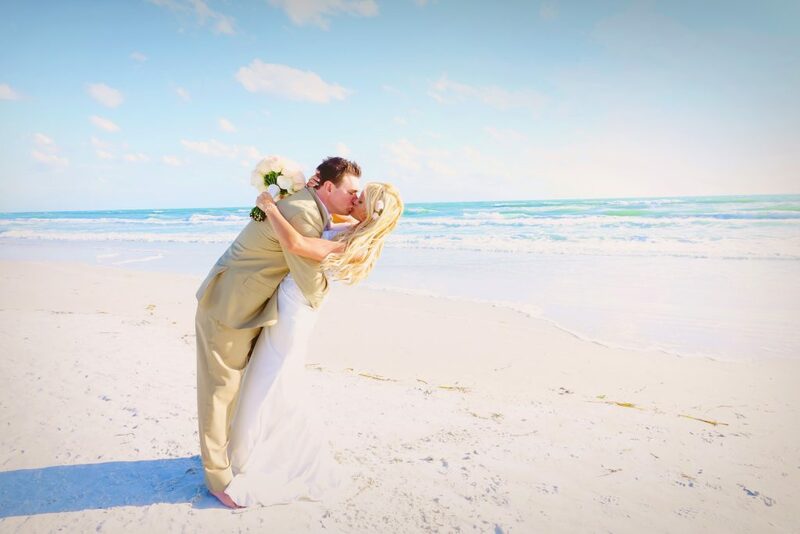 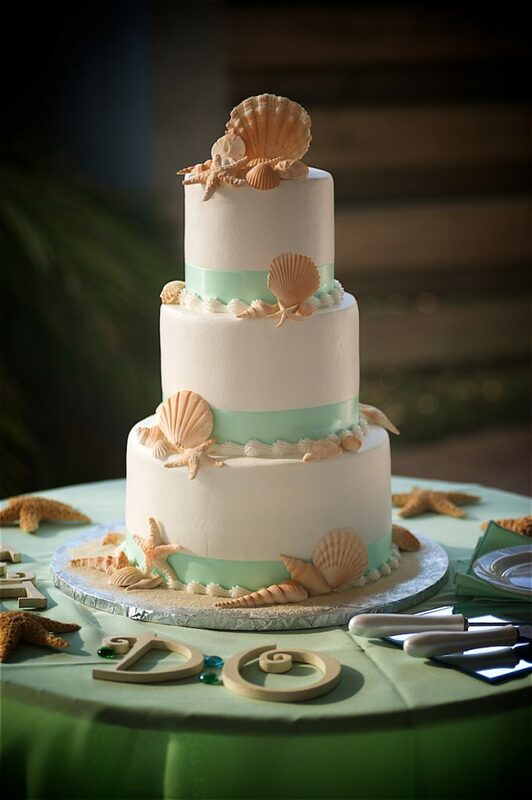 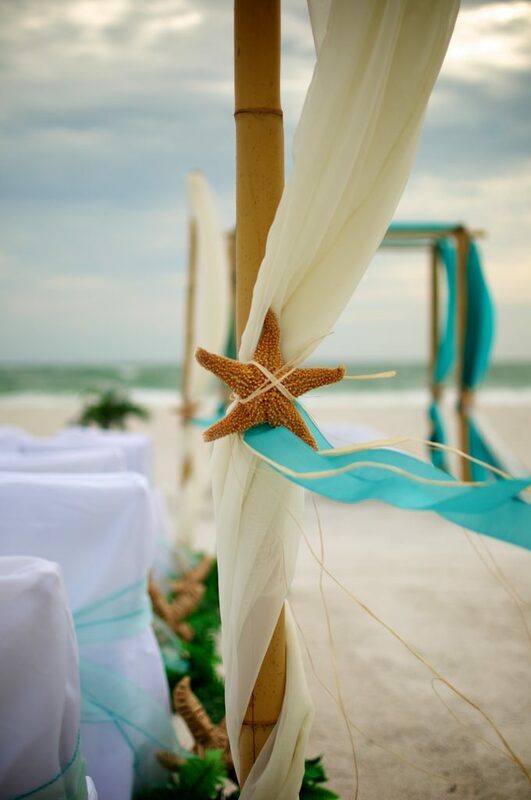 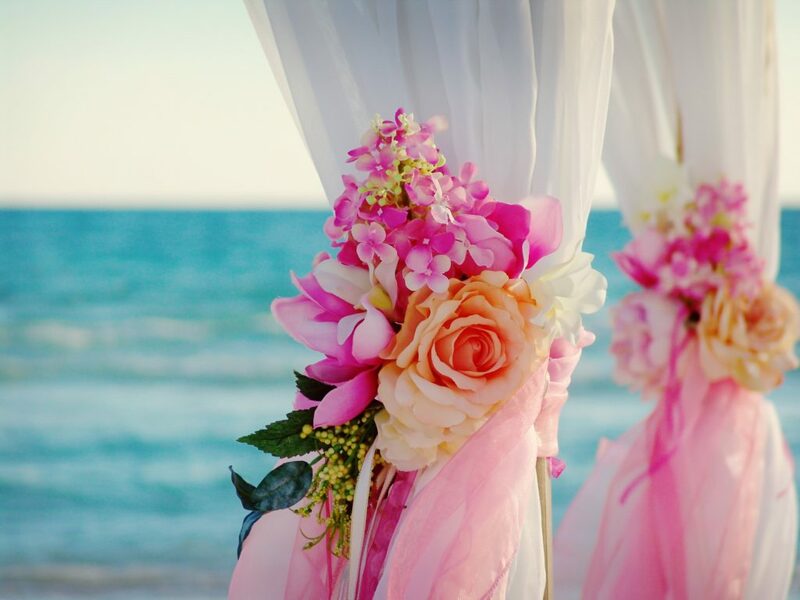 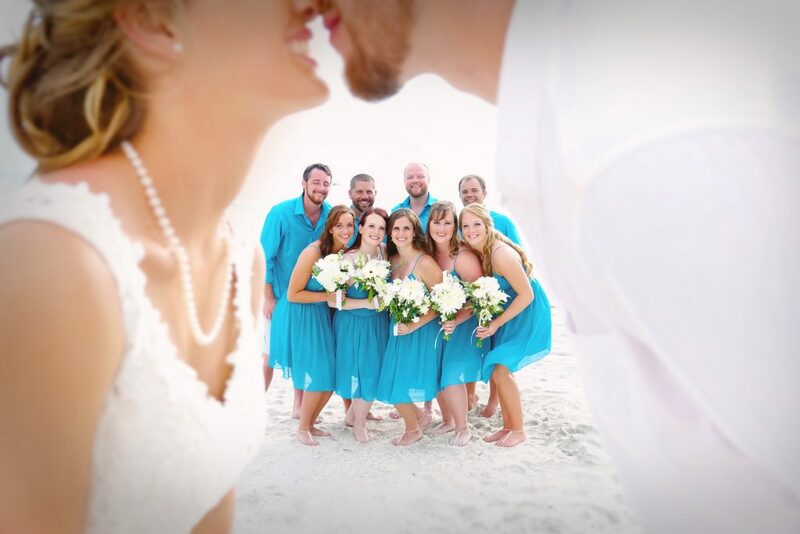 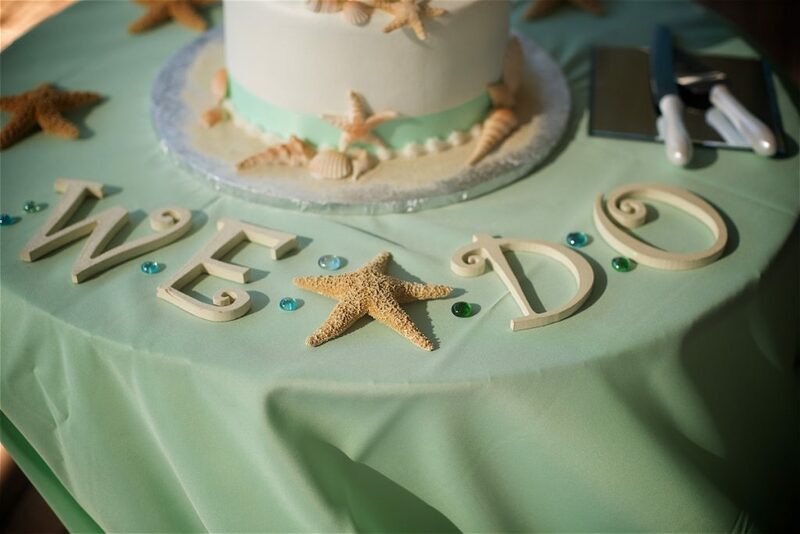 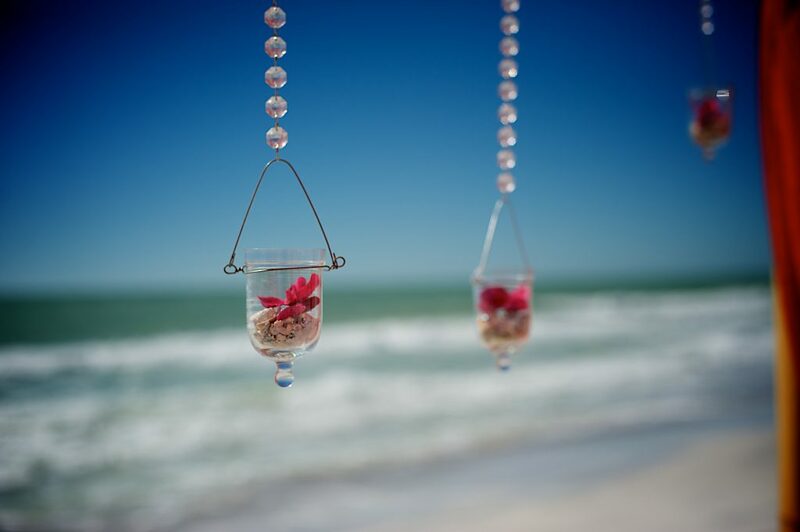 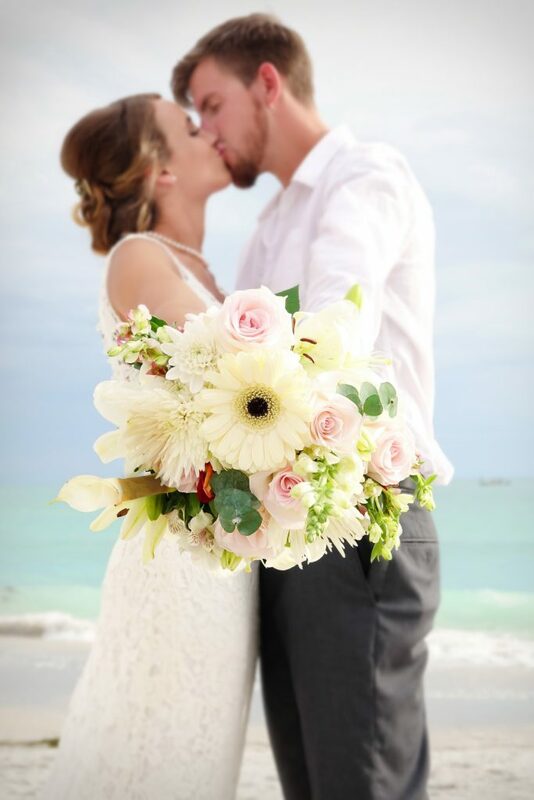 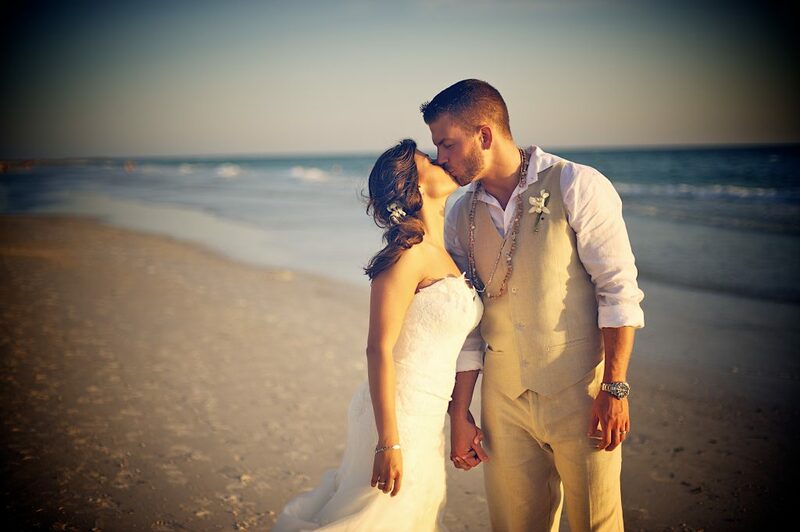 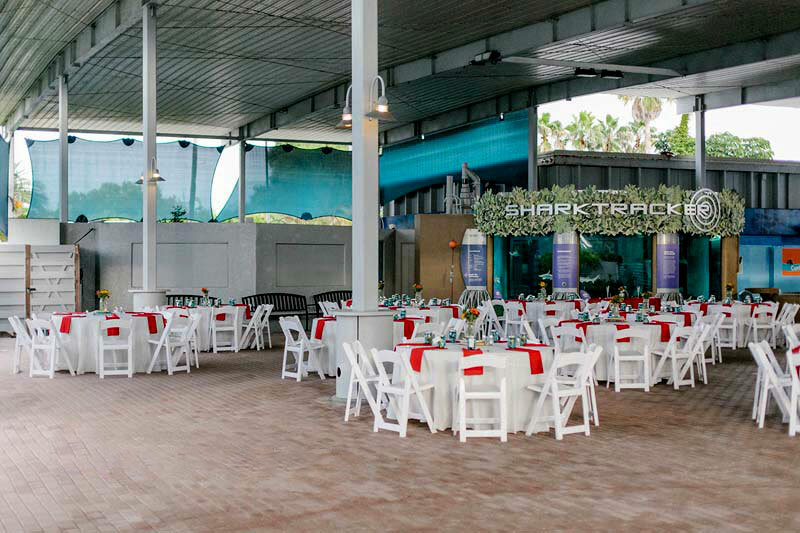 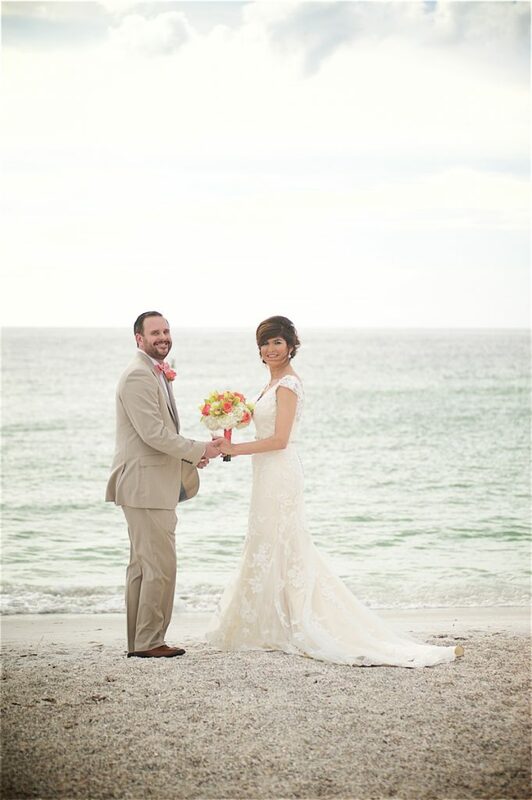 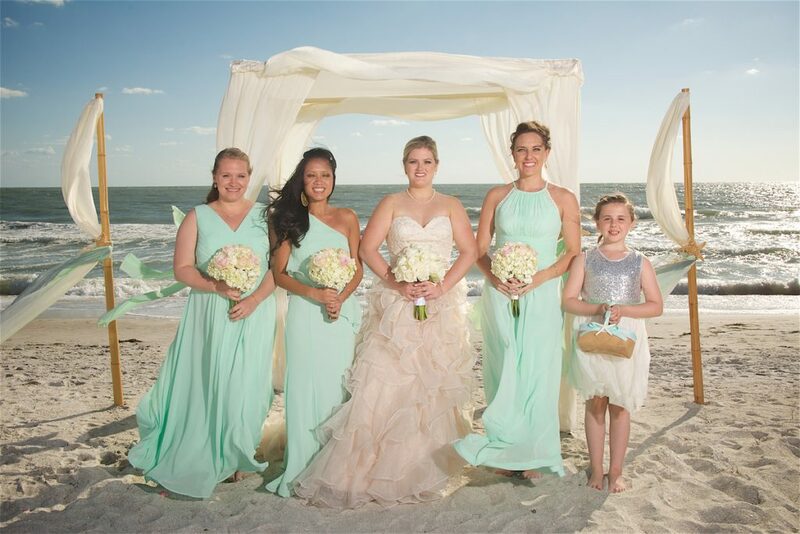 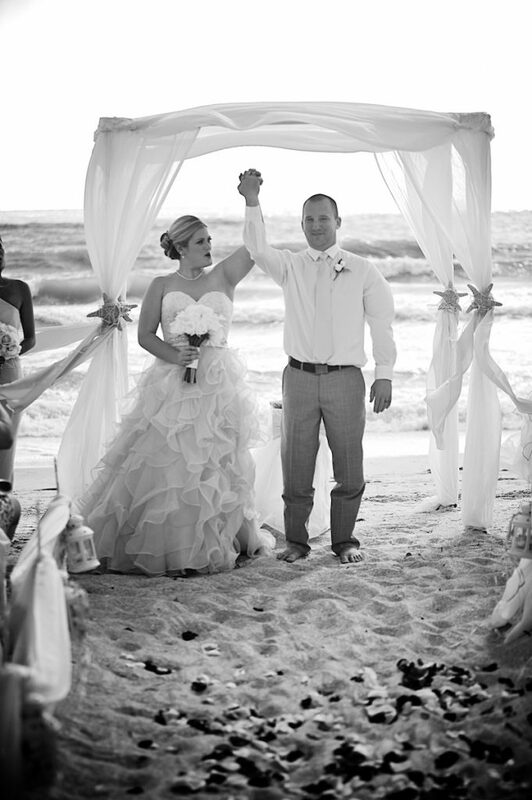 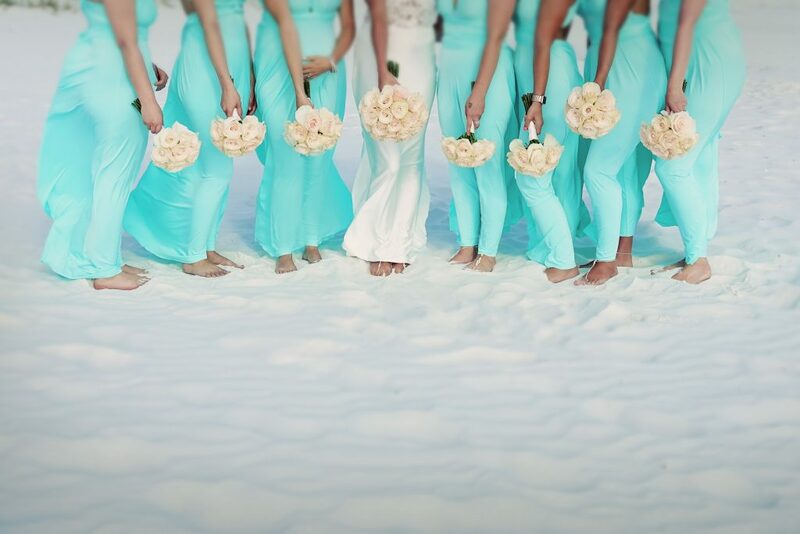 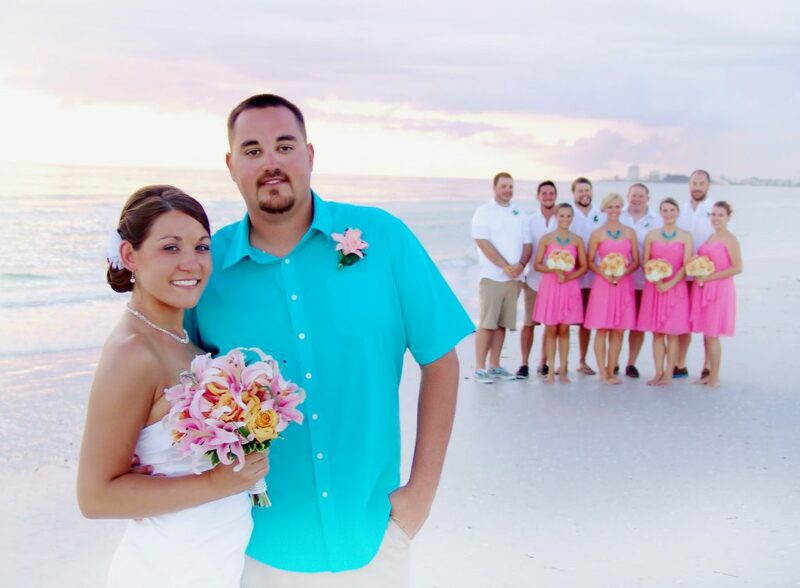 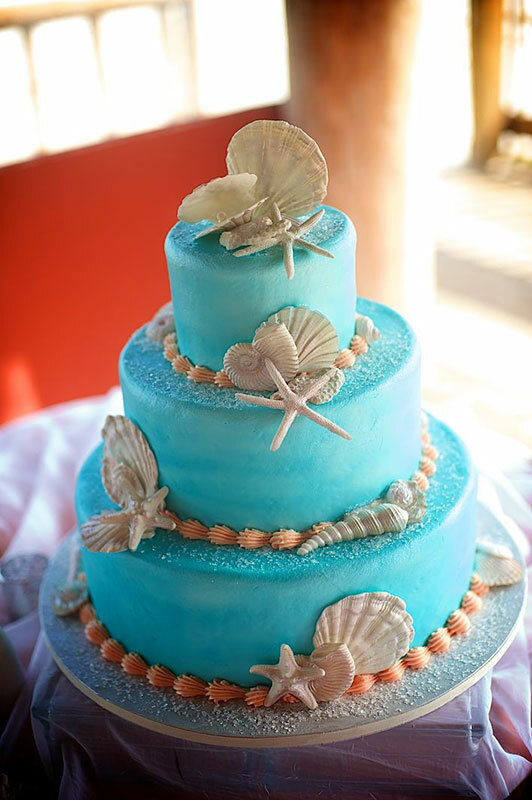 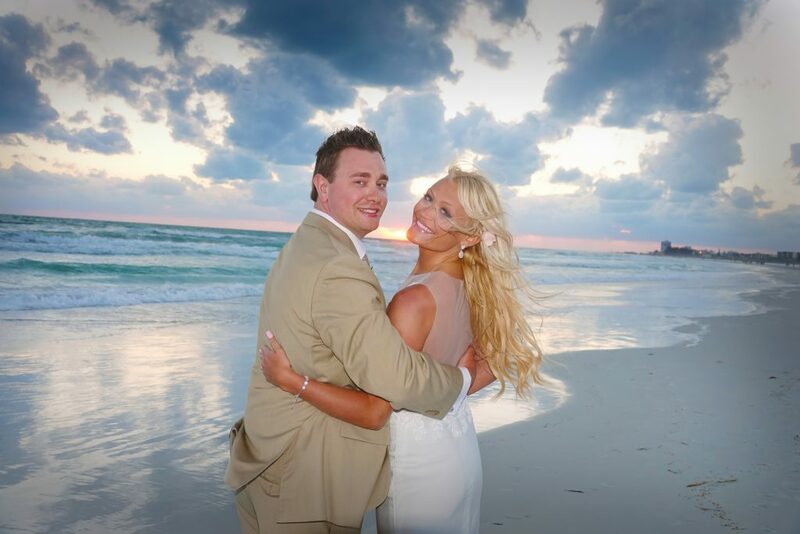 A beautiful Florida Beach wedding with Aquarium reception. 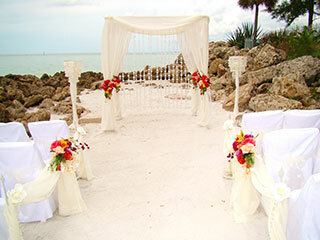 All inlcusive package, we make it easy! 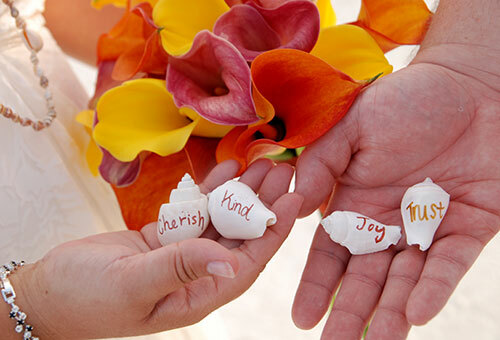 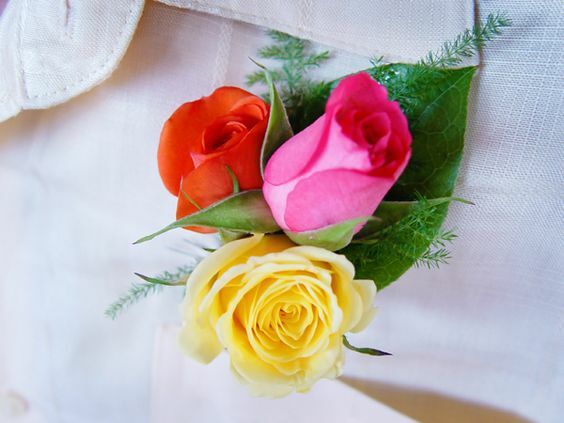 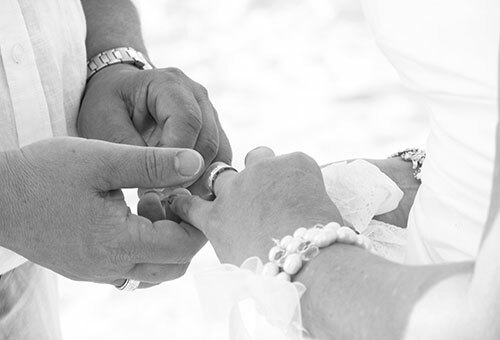 Officiant (includes complimentary filing of marriage certificate). 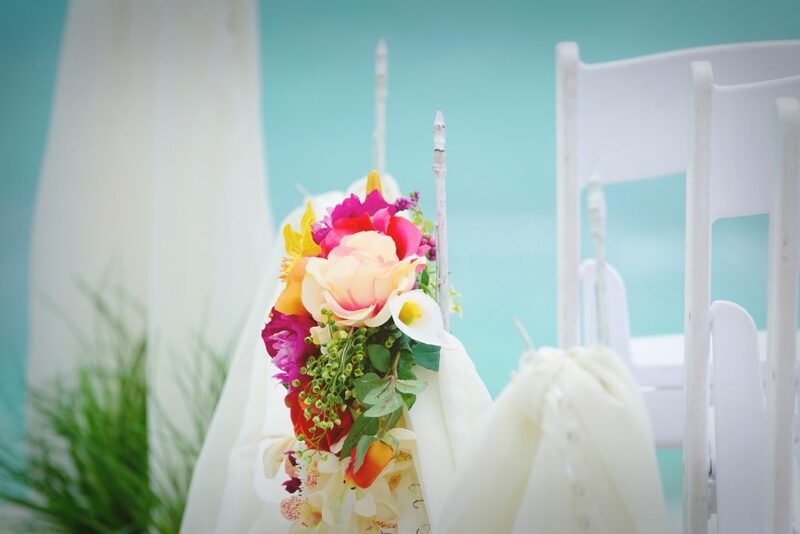 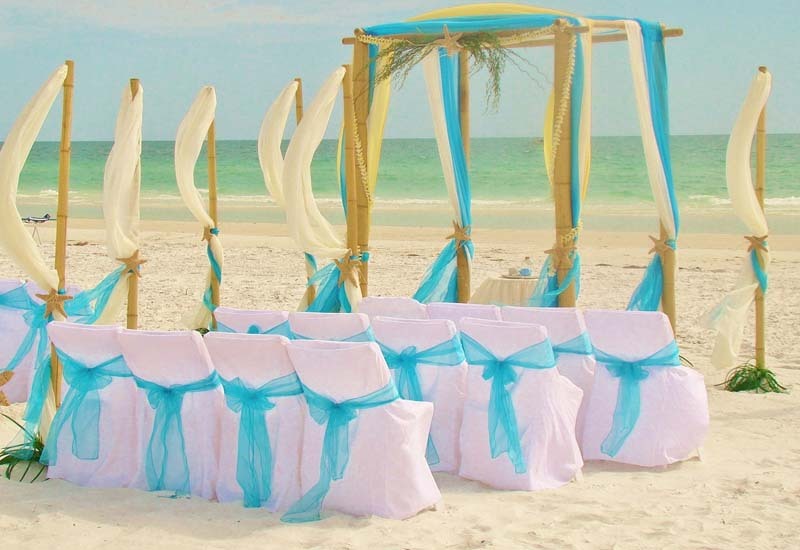 20 white padded folding style chairs including white chair covers and your choice of colored chair bows from our color chart. A live Musician for all ceremony music. 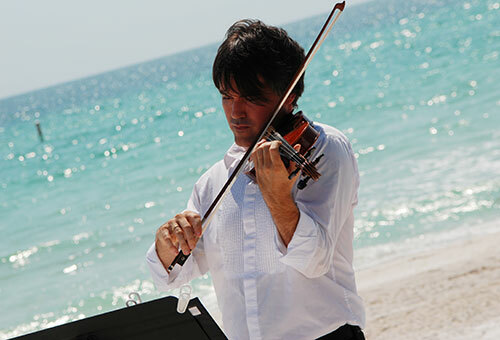 (Choose from steel pan drummer, acoustic guitarist, violinist or cellist). 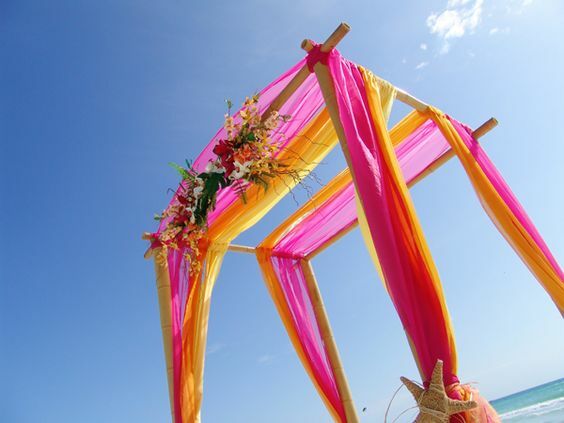 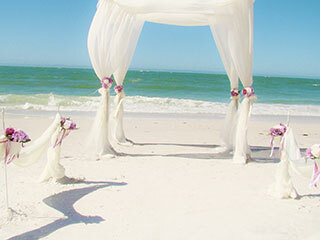 Your choice of any SPW pictured ceremony canopy and decor set-up. 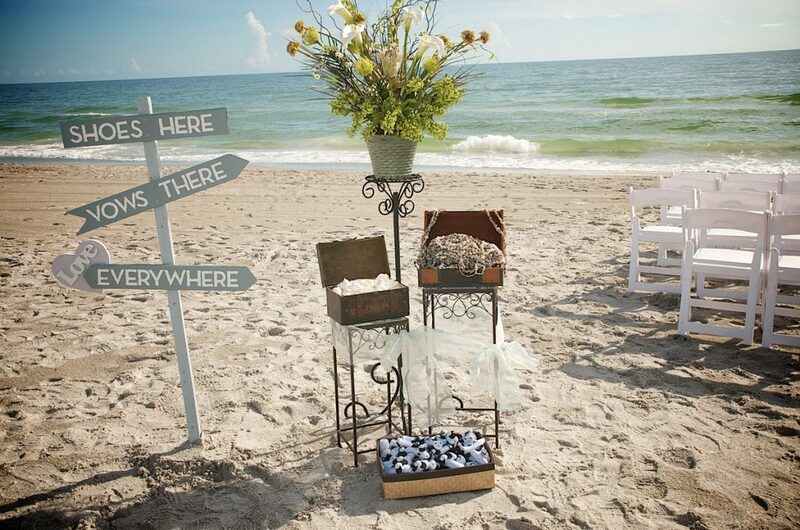 Click Here to see your many choices! 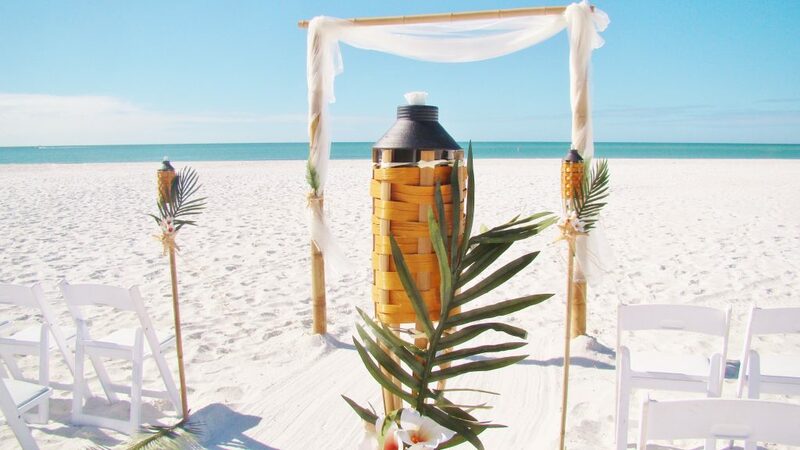 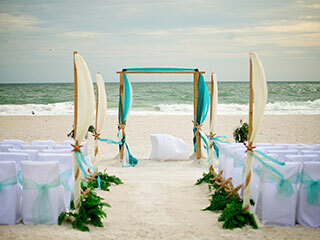 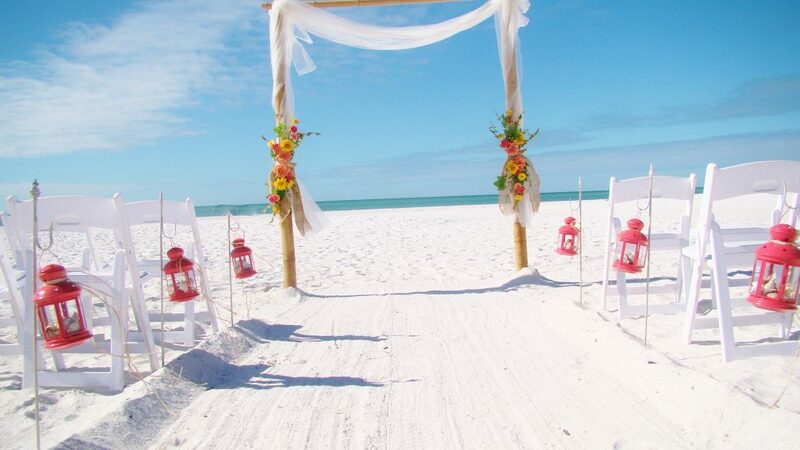 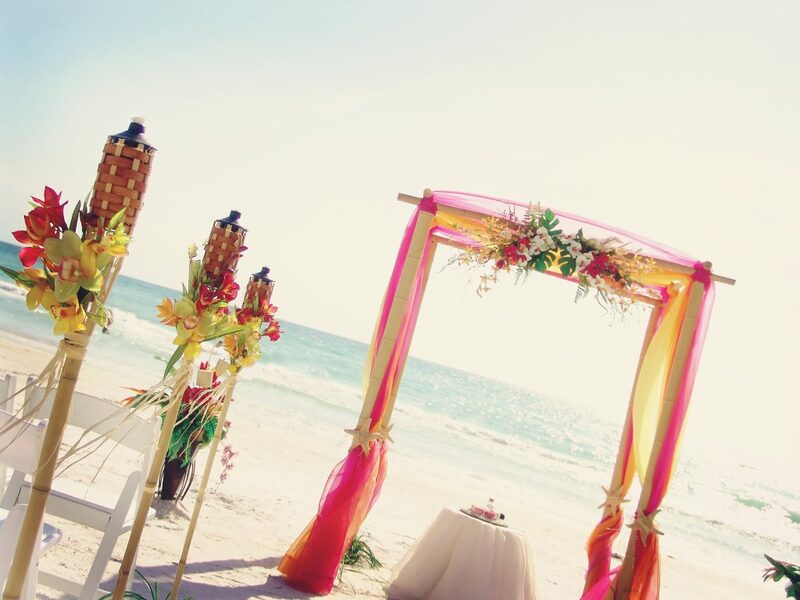 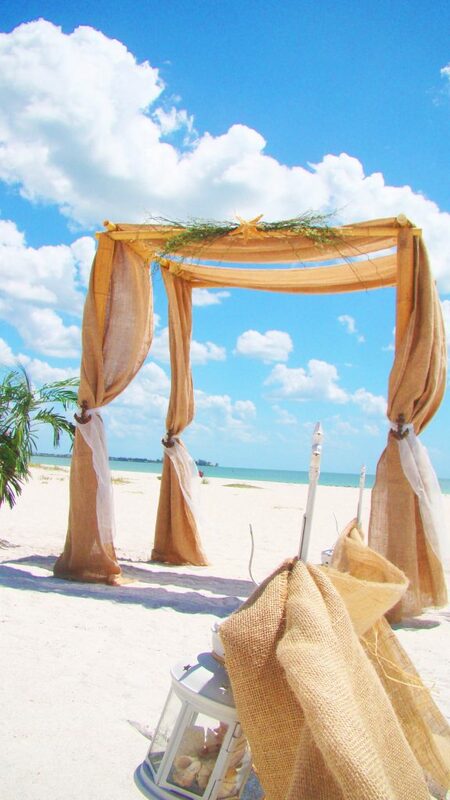 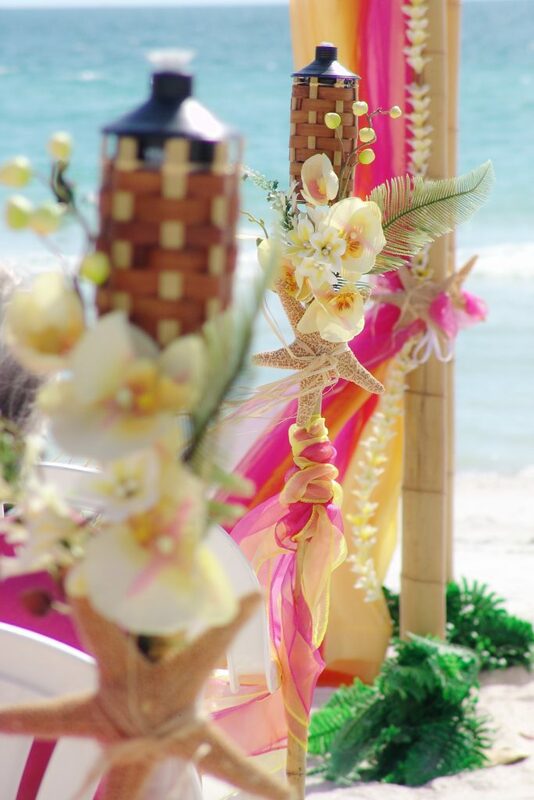 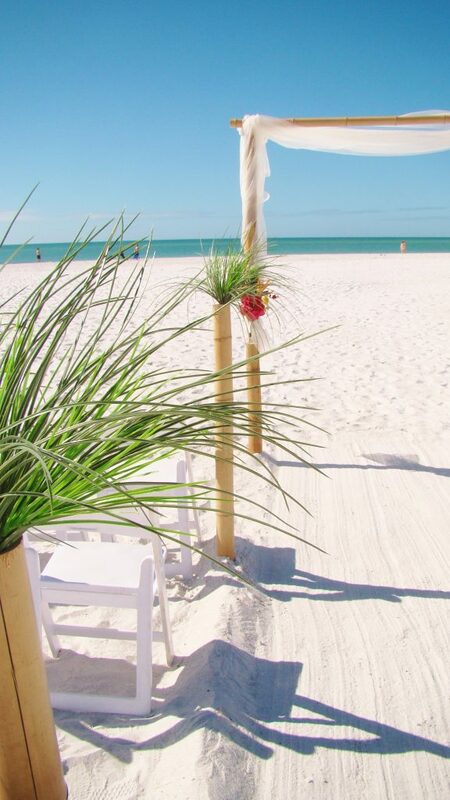 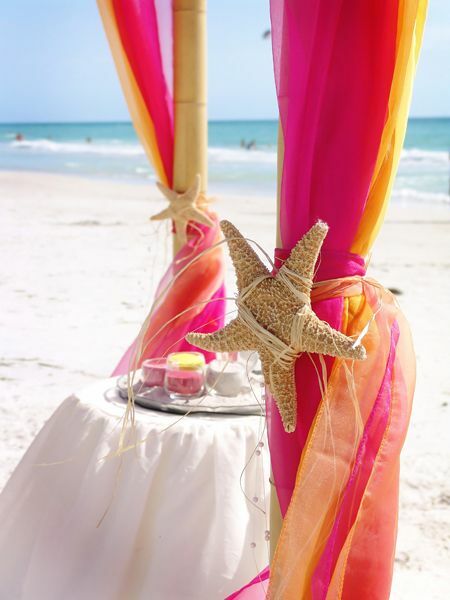 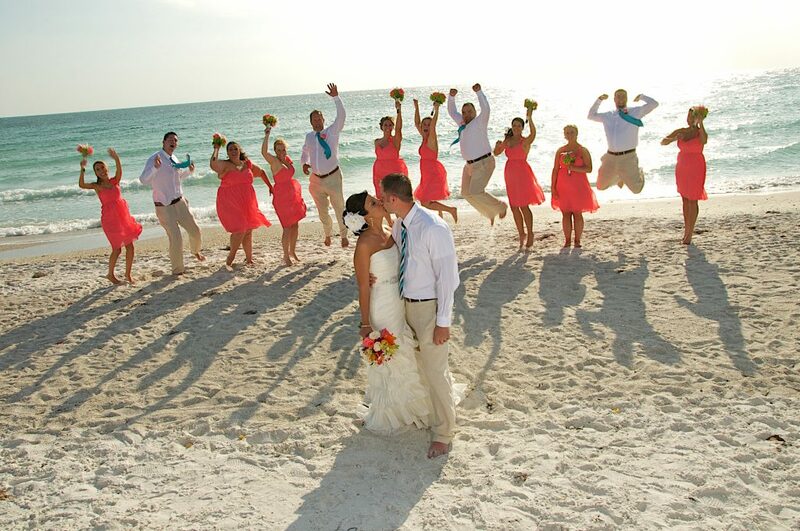 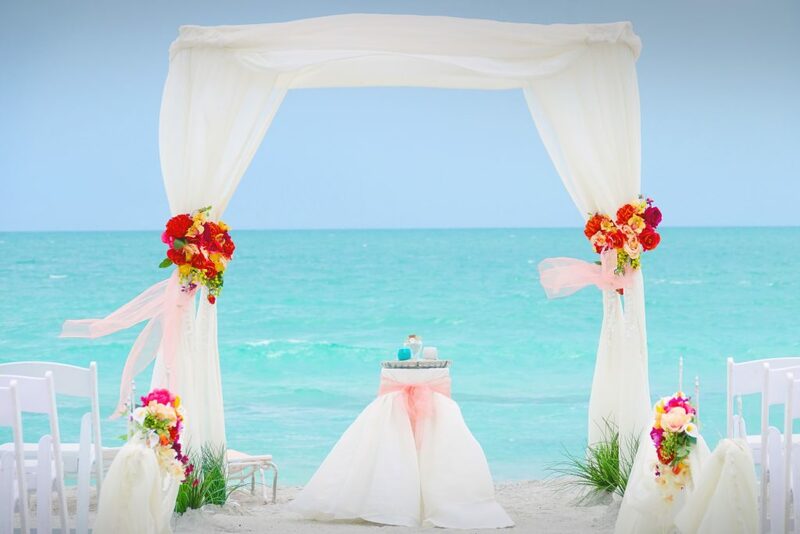 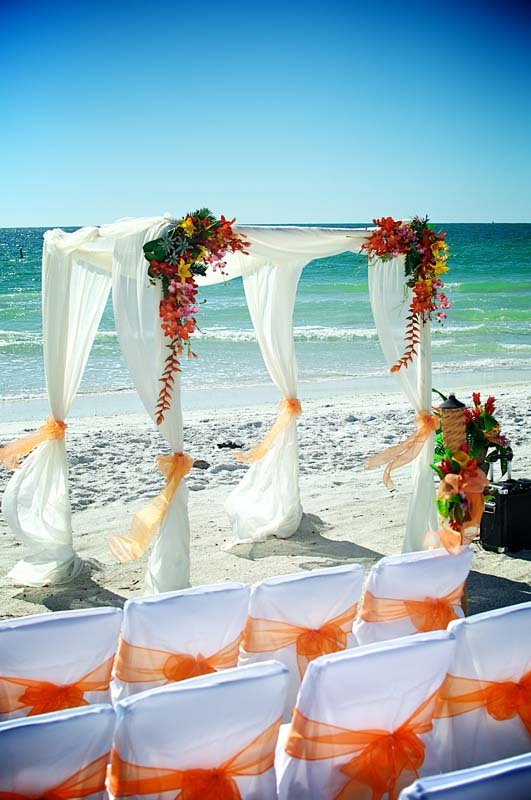 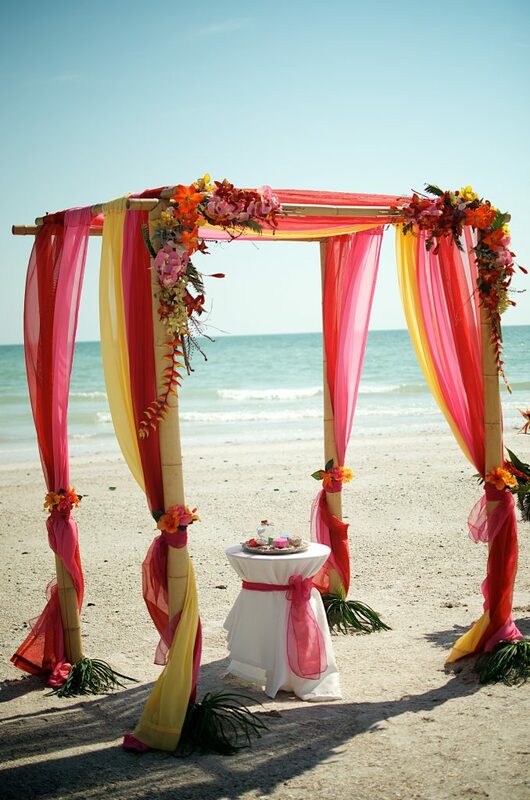 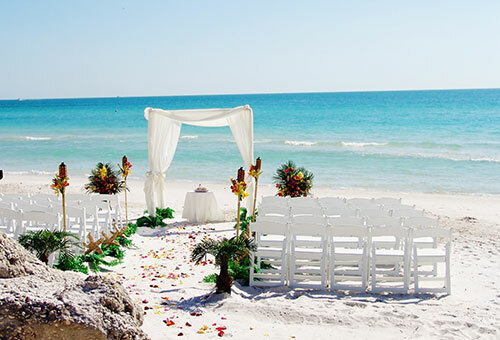 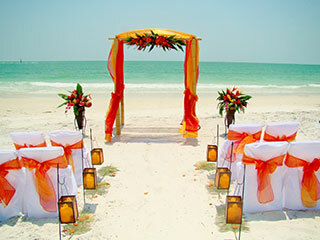 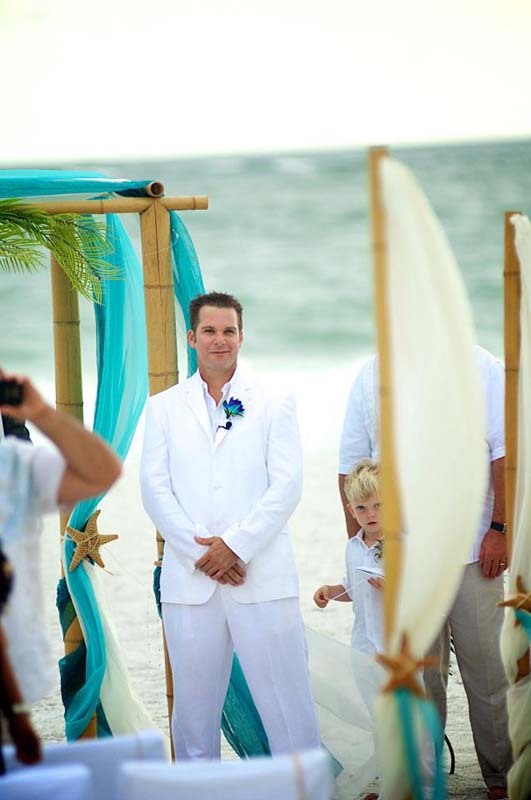 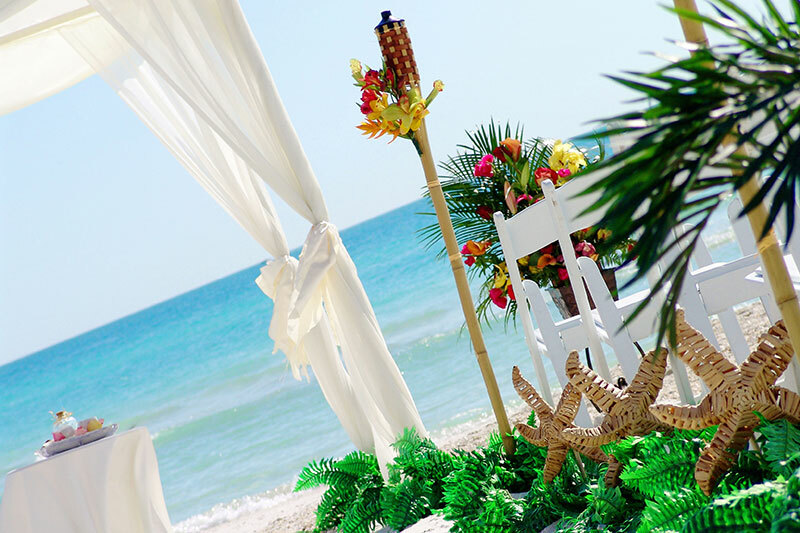 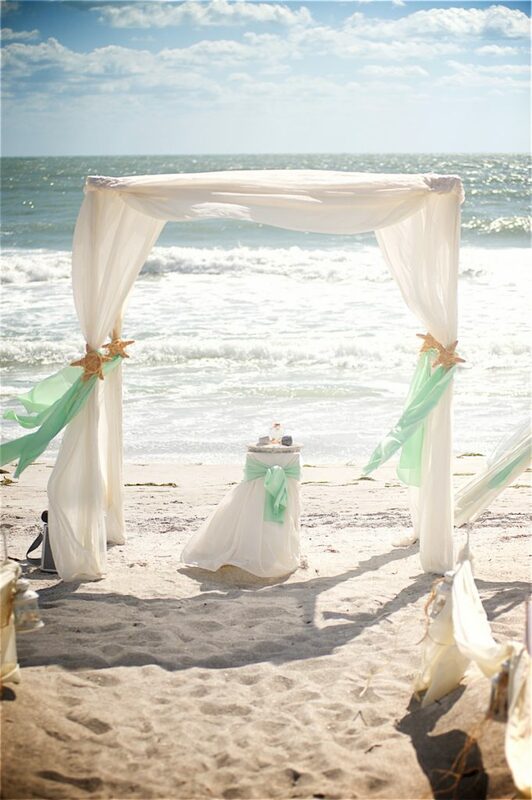 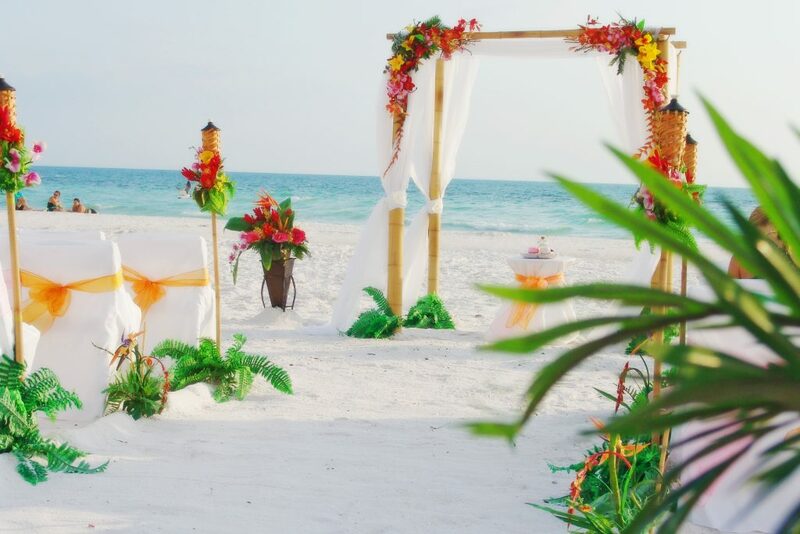 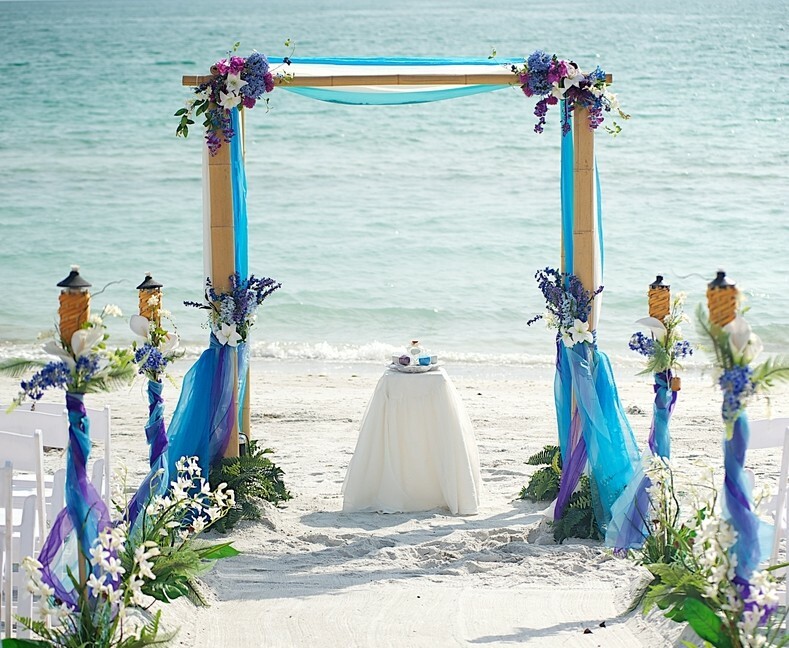 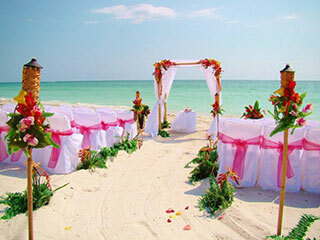 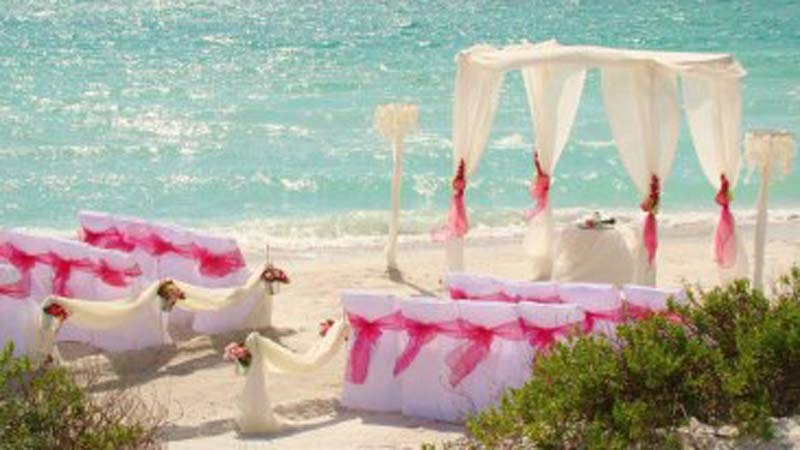 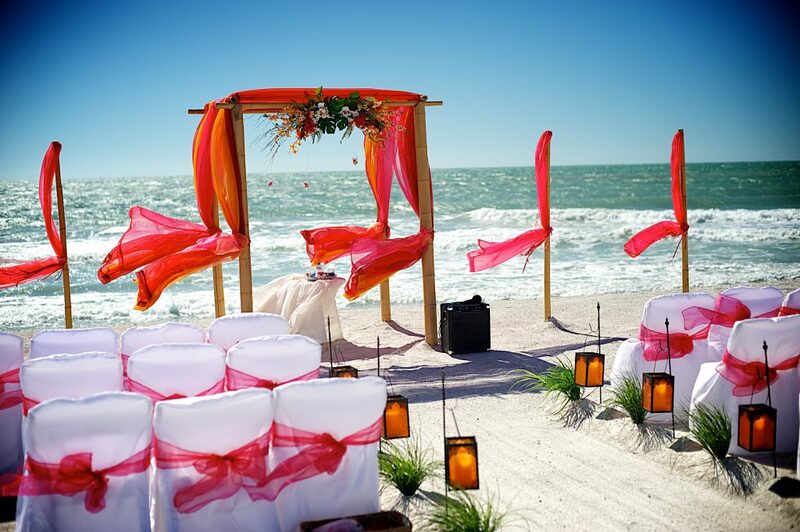 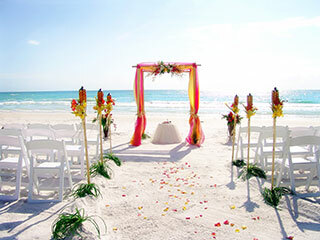 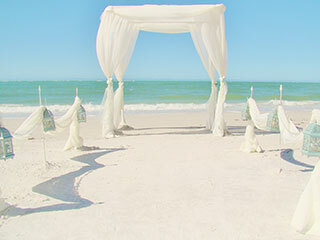 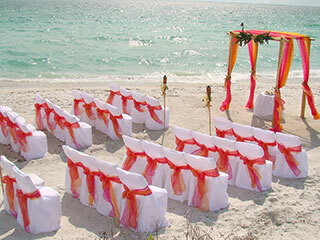 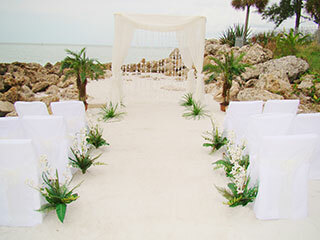 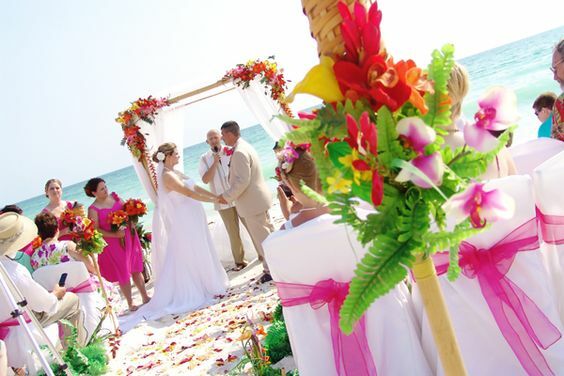 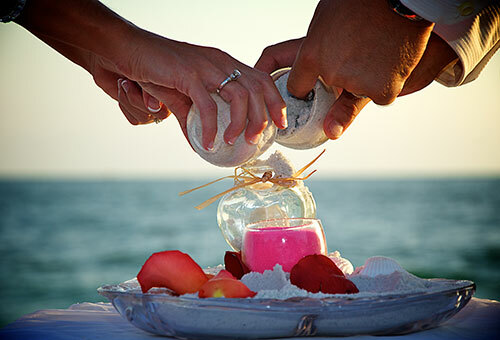 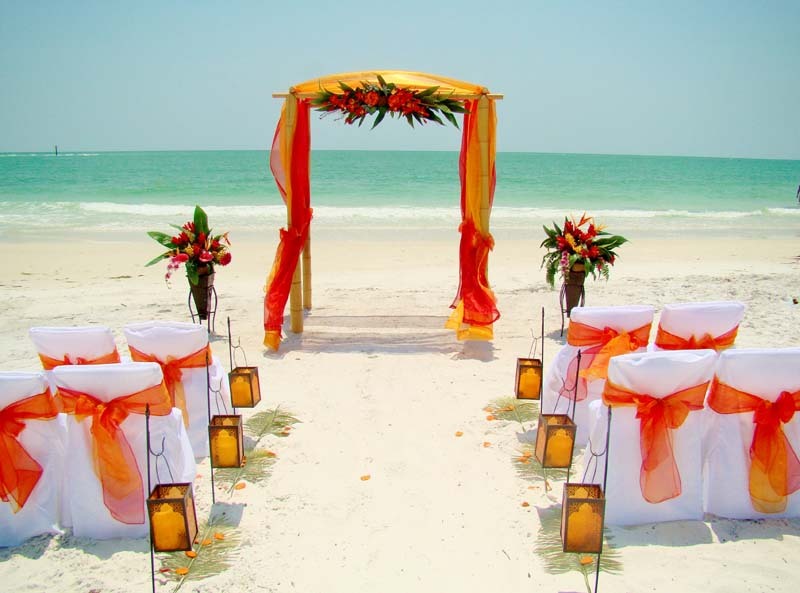 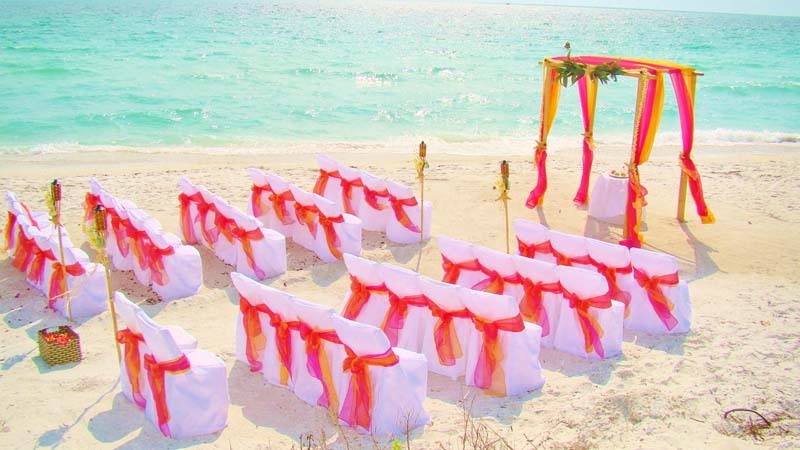 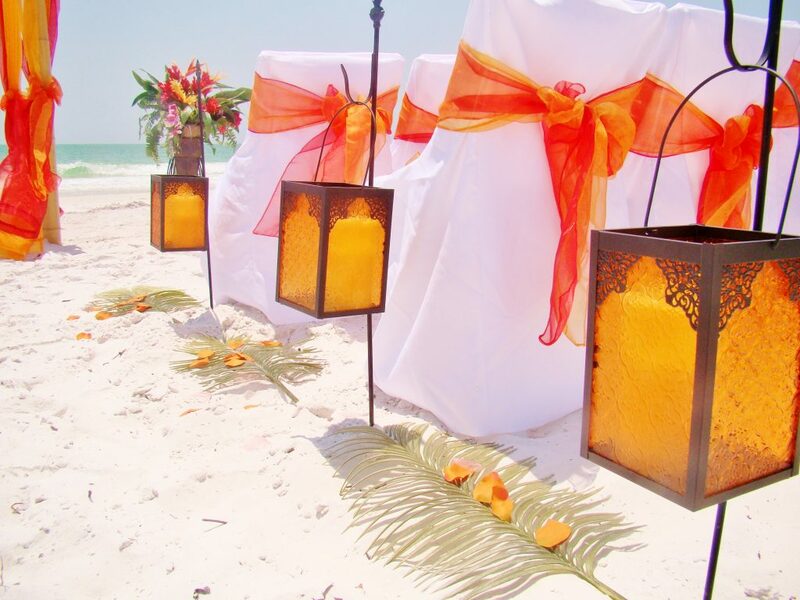 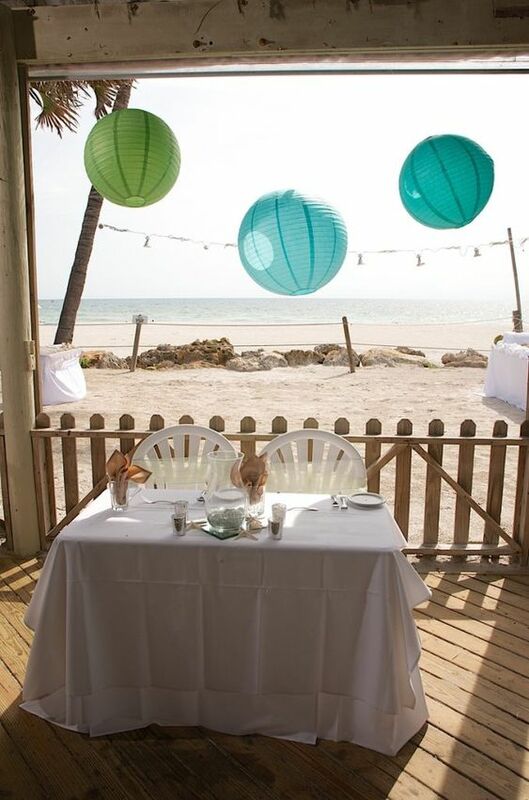 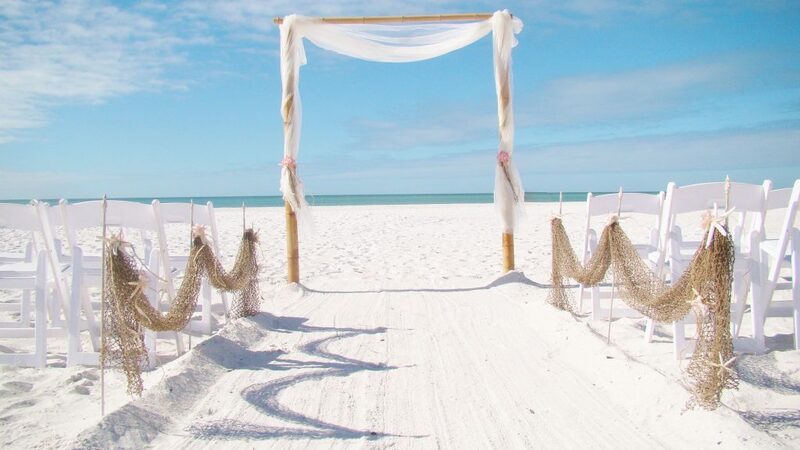 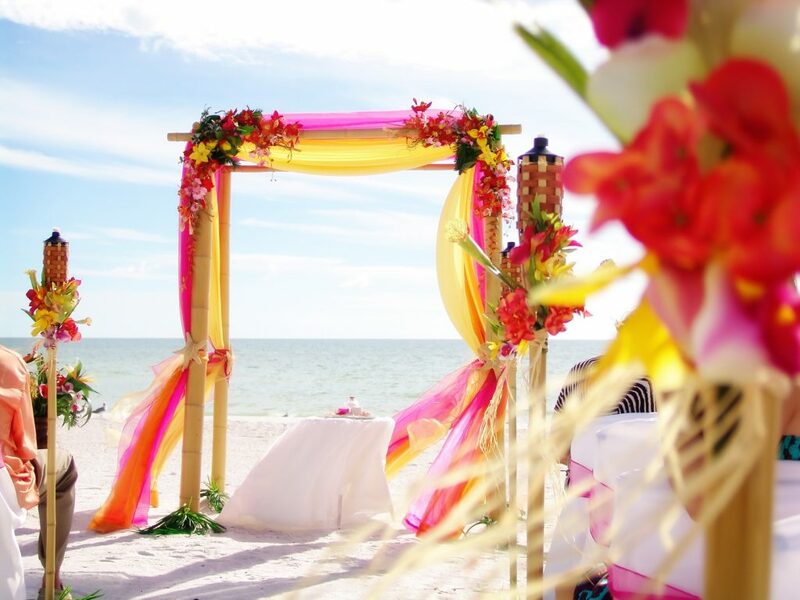 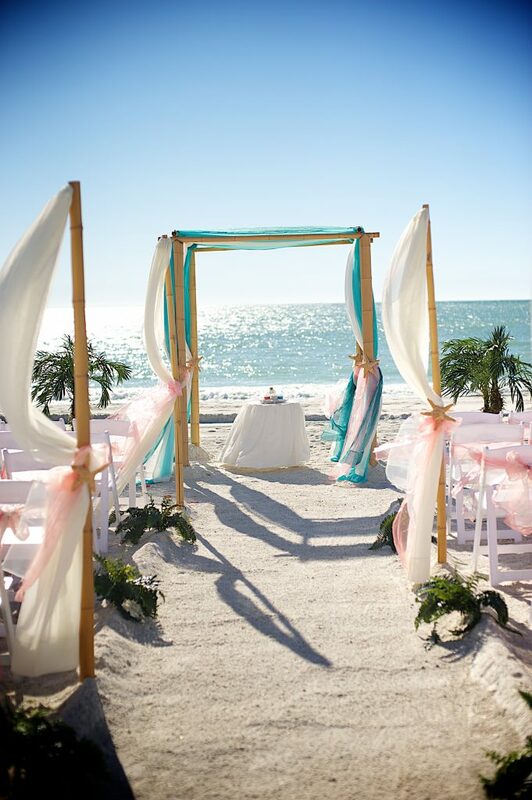 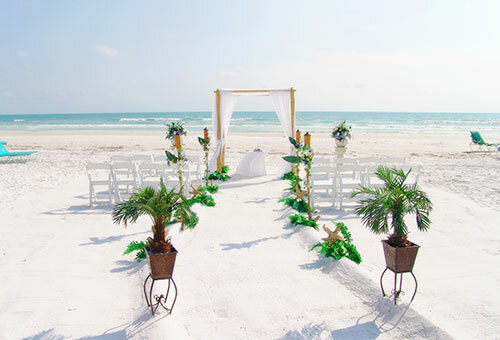 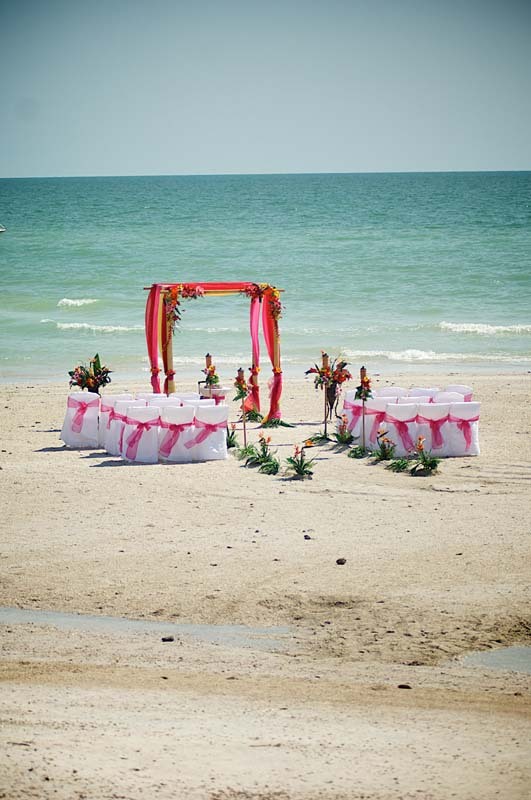 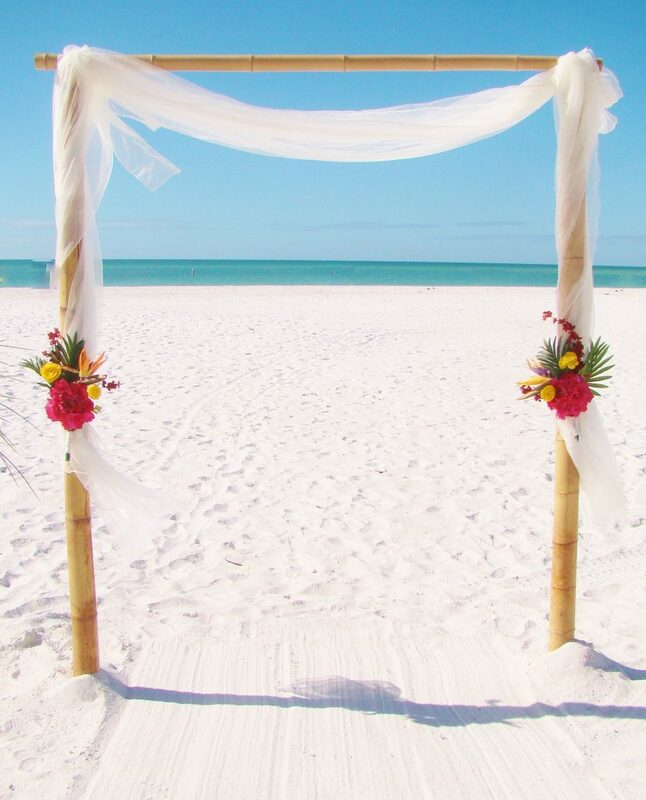 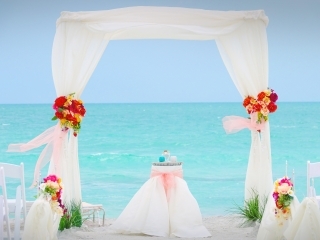 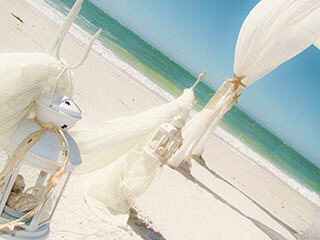 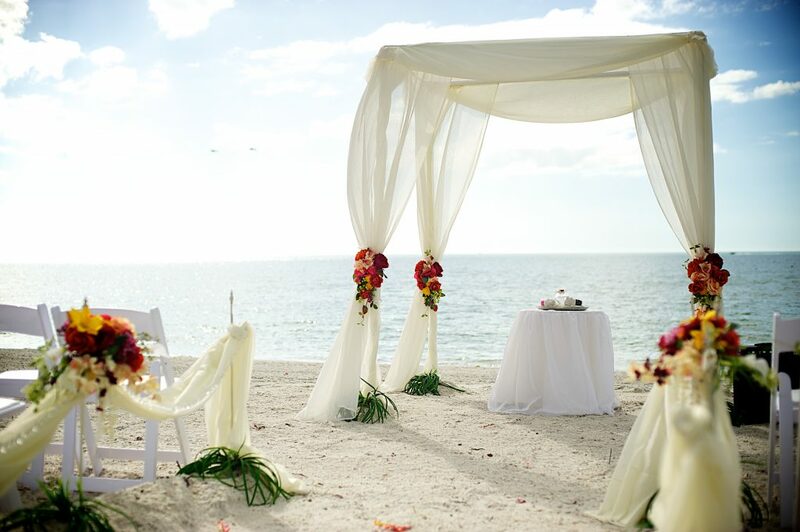 Clean, sweep and smooth beach ceremony site. 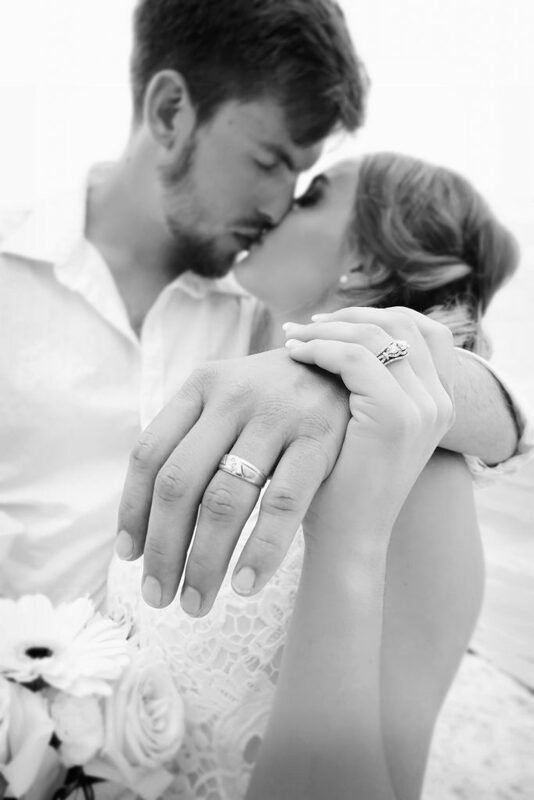 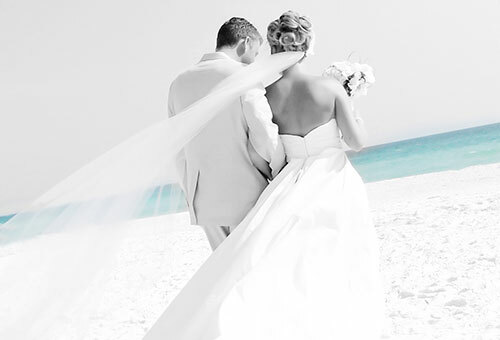 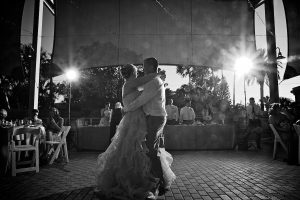 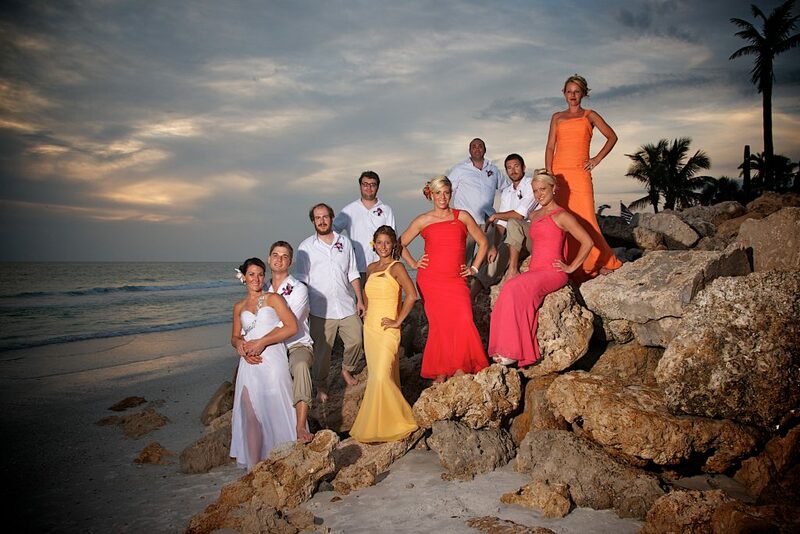 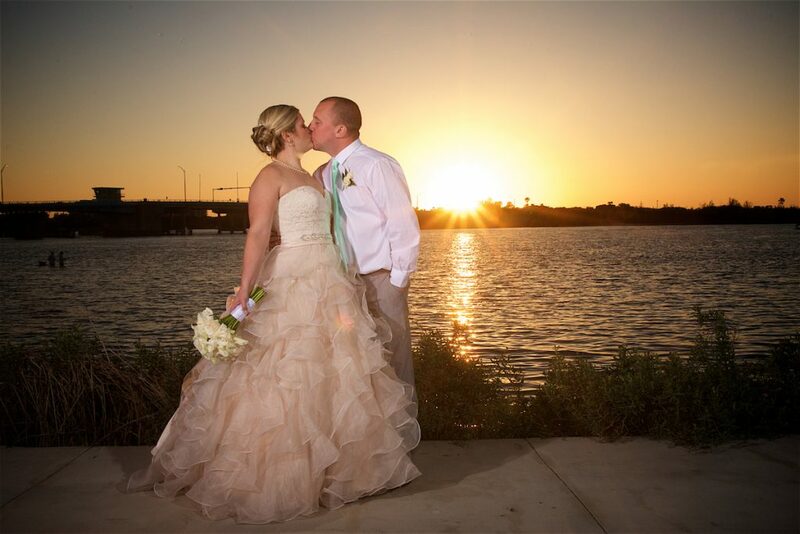 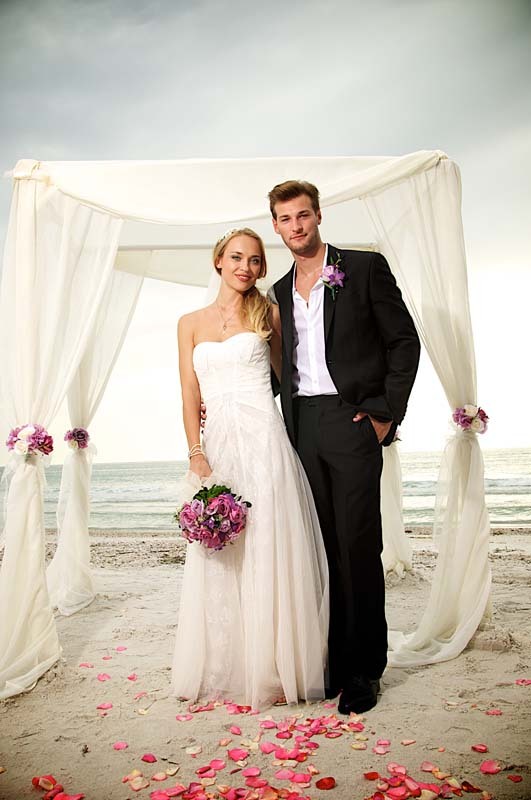 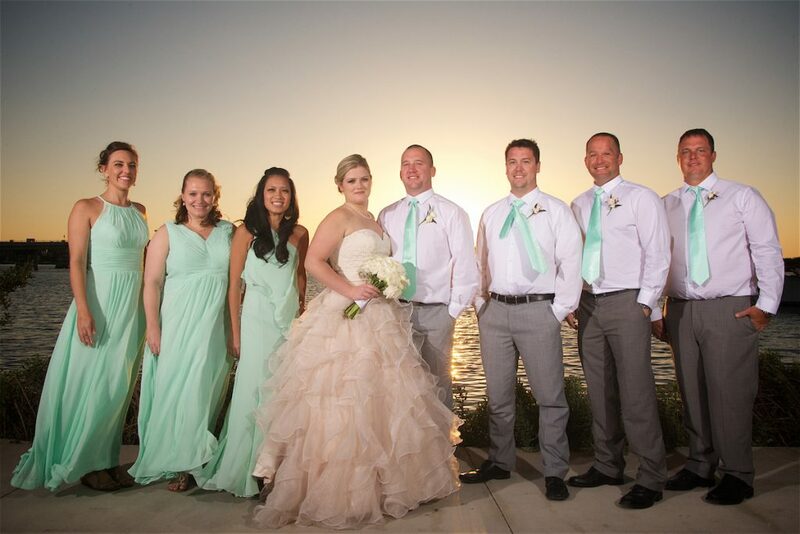 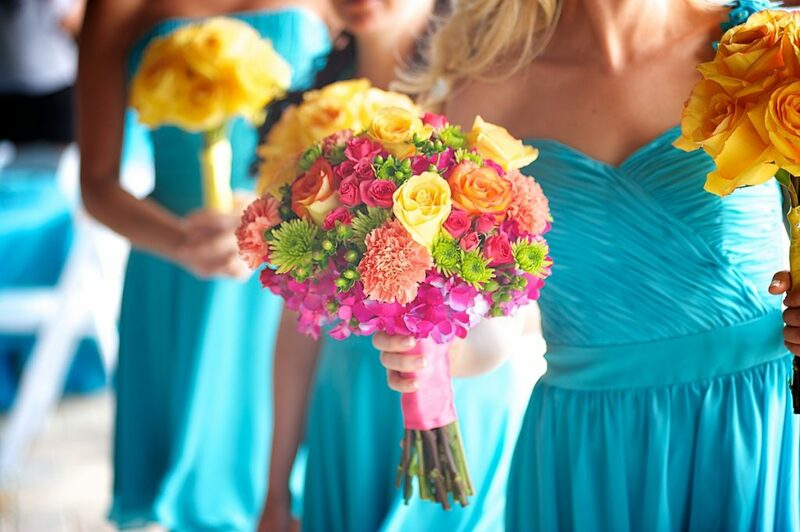 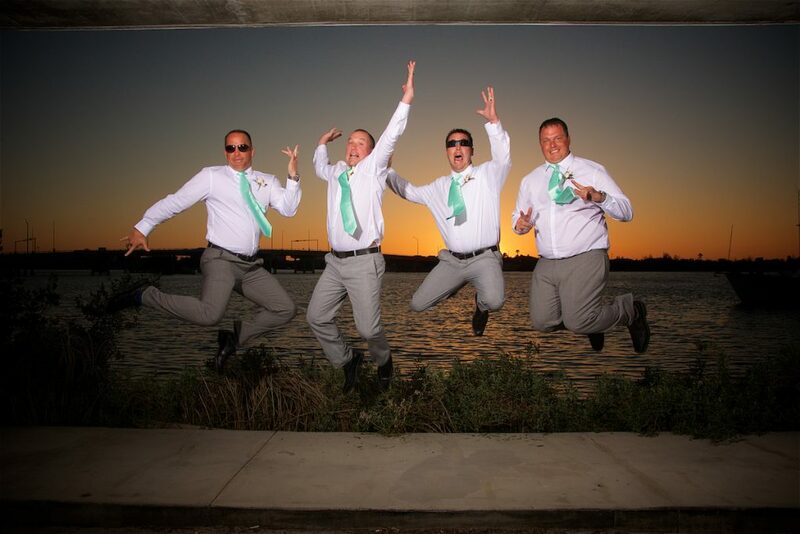 Professional Photographer – (4 hrs hours of ceremony and reception coverage). 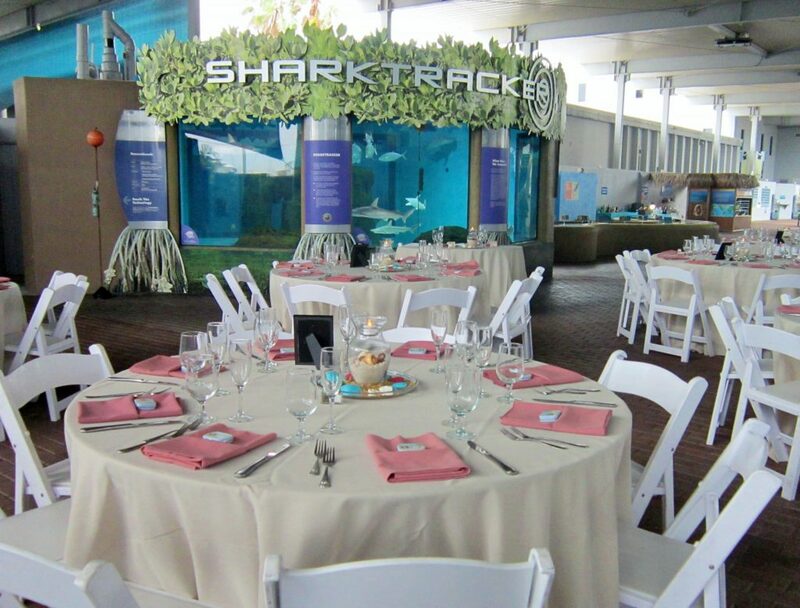 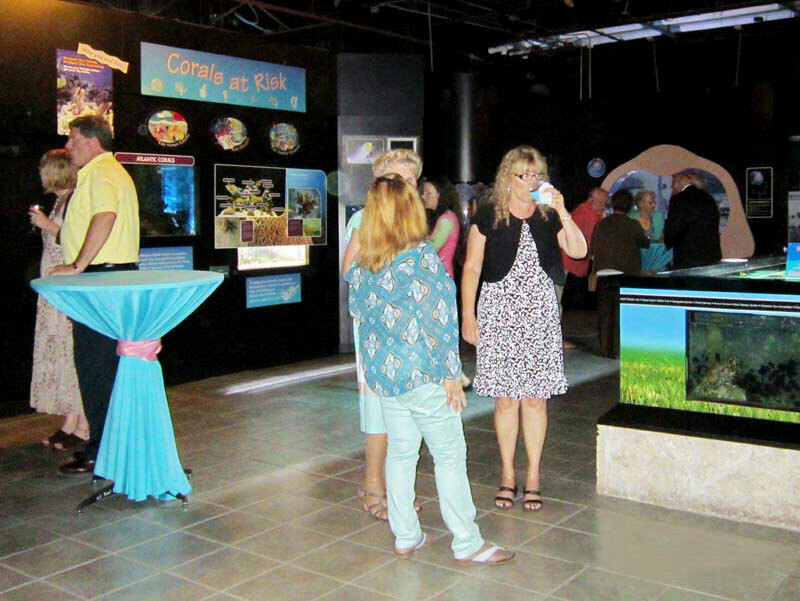 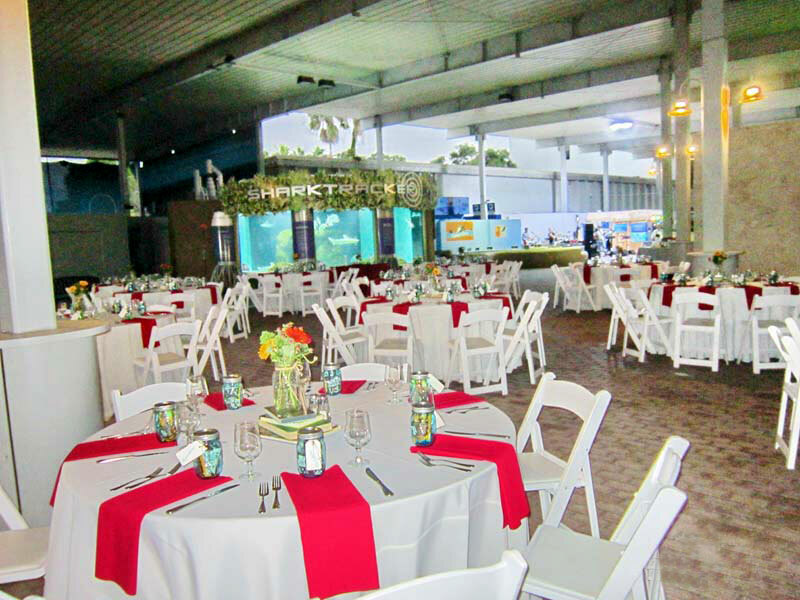 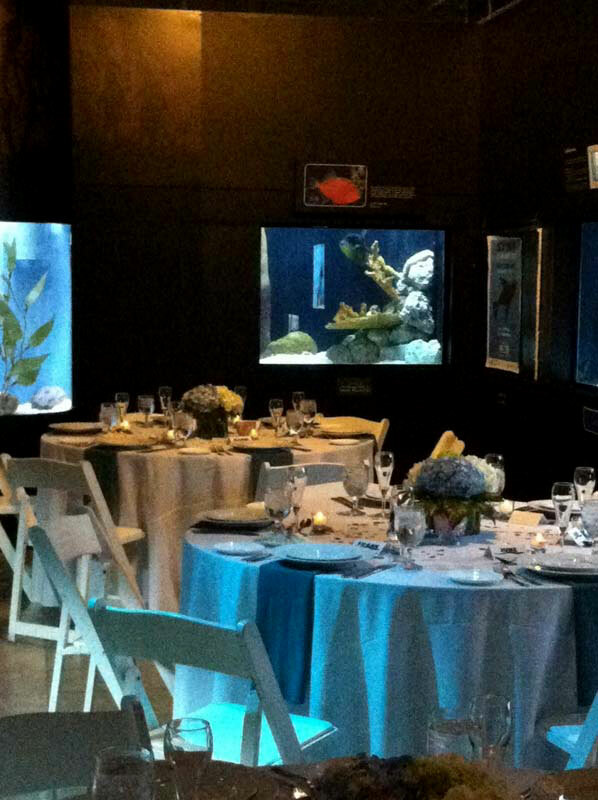 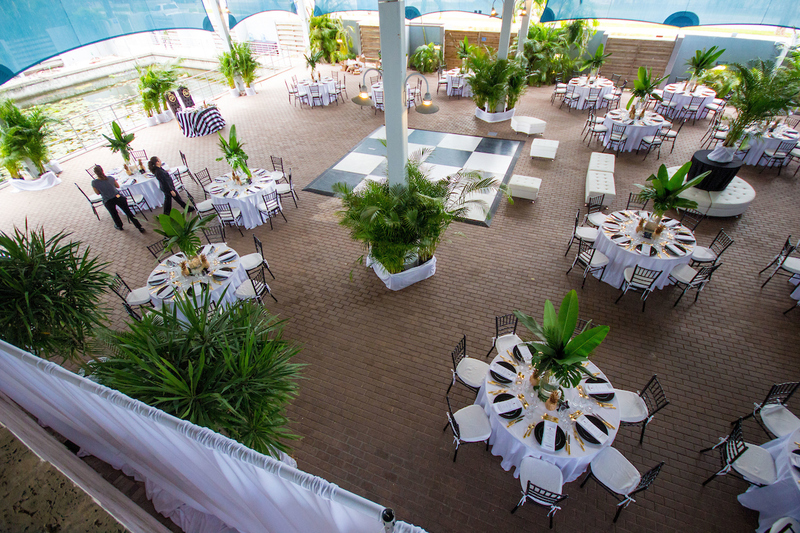 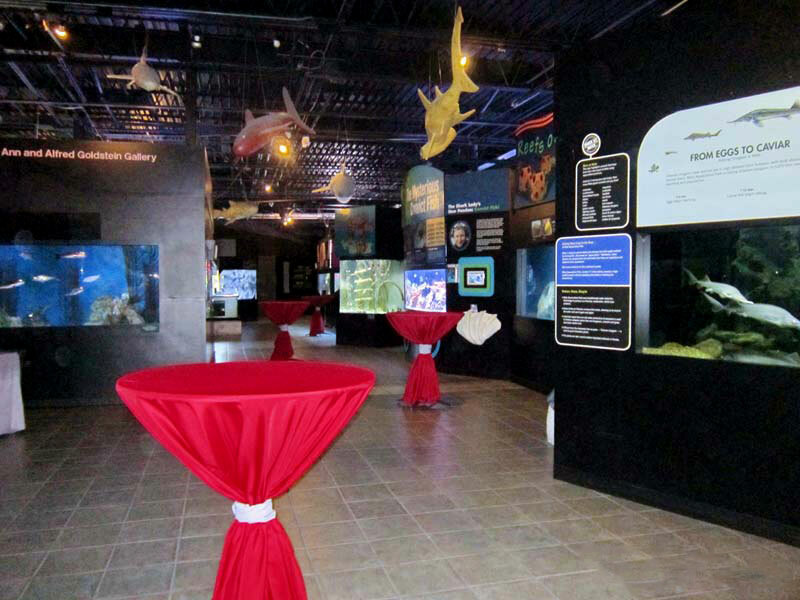 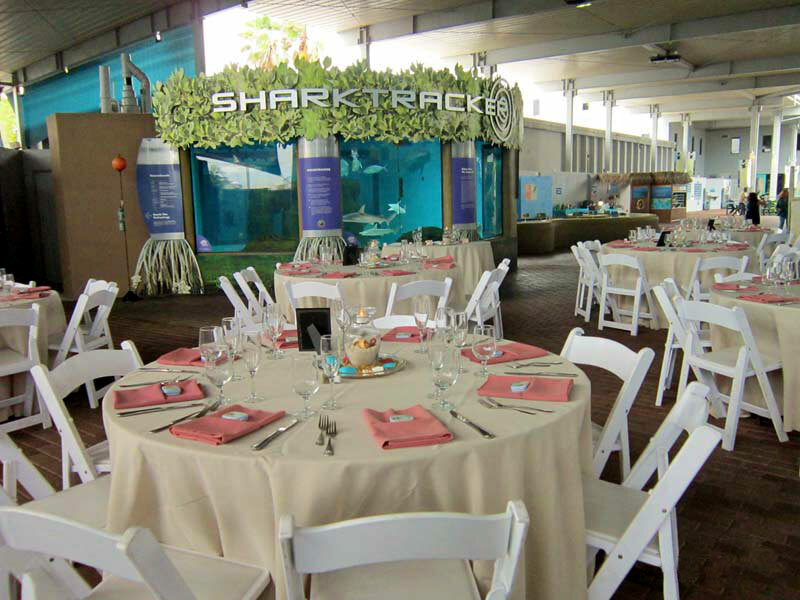 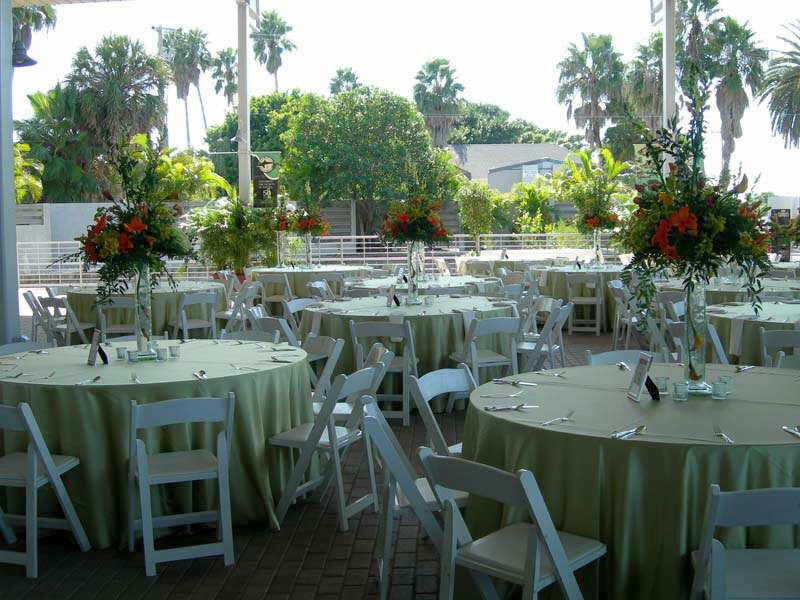 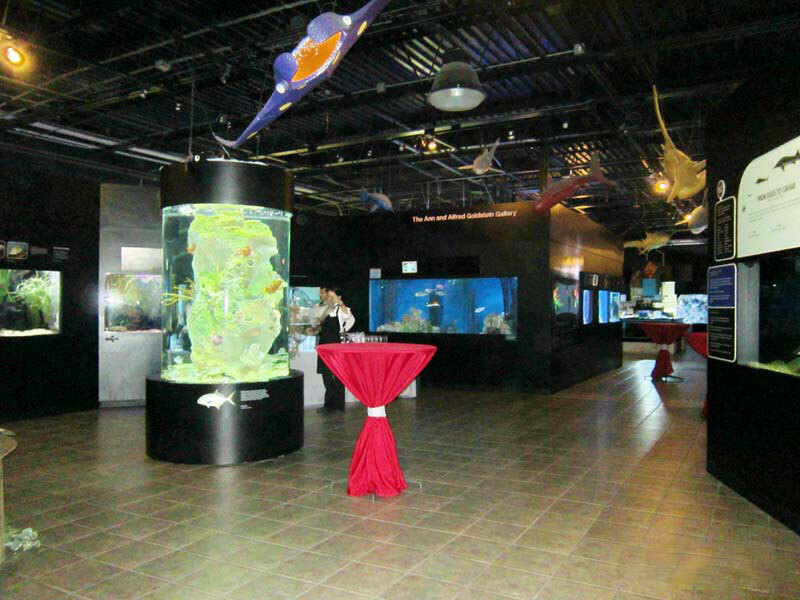 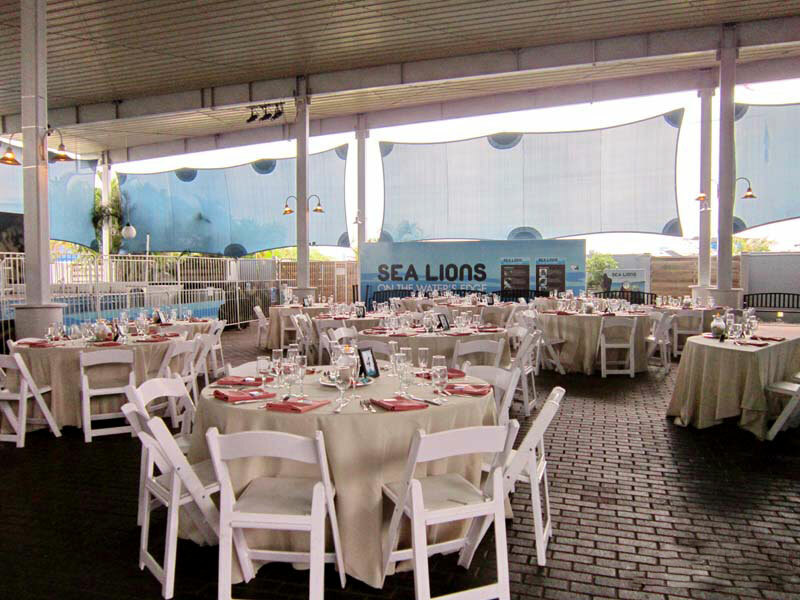 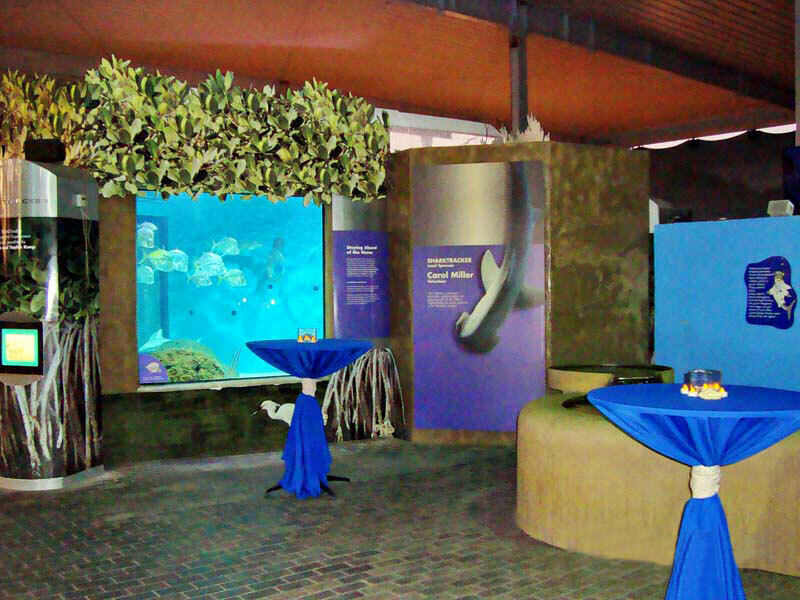 Includes: Exclusive private viewing and touring of the Aquarium for you and your wedding guests. 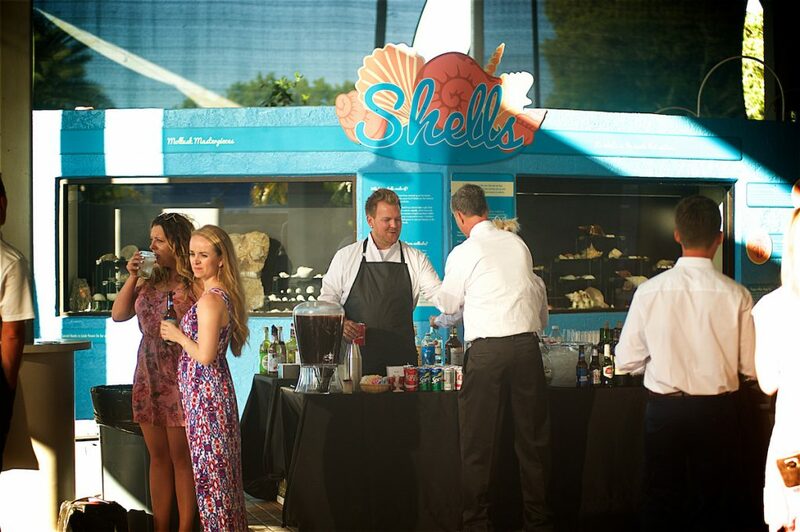 Includes bartender and bartending station with mixers, juices, garnishes and sodas. Includes high top cocktail tables. 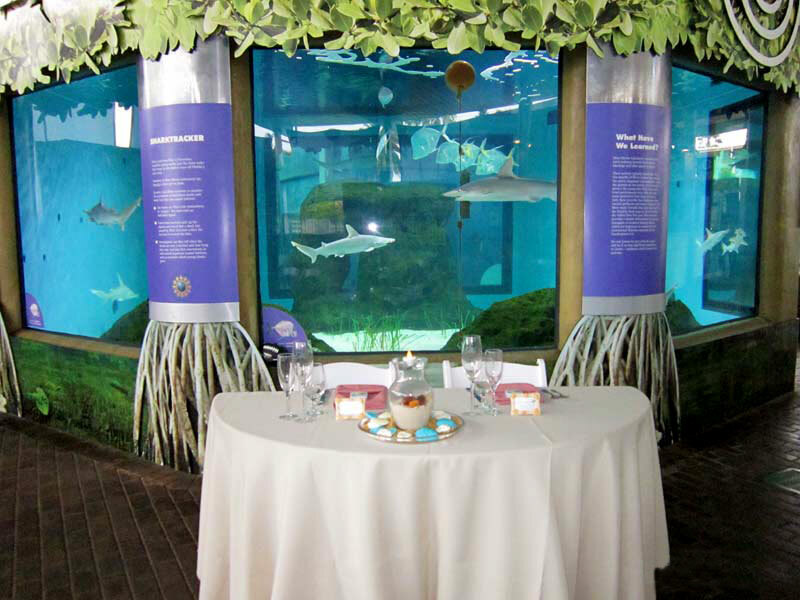 Includes a decorated welcome/sign-in and gift table. 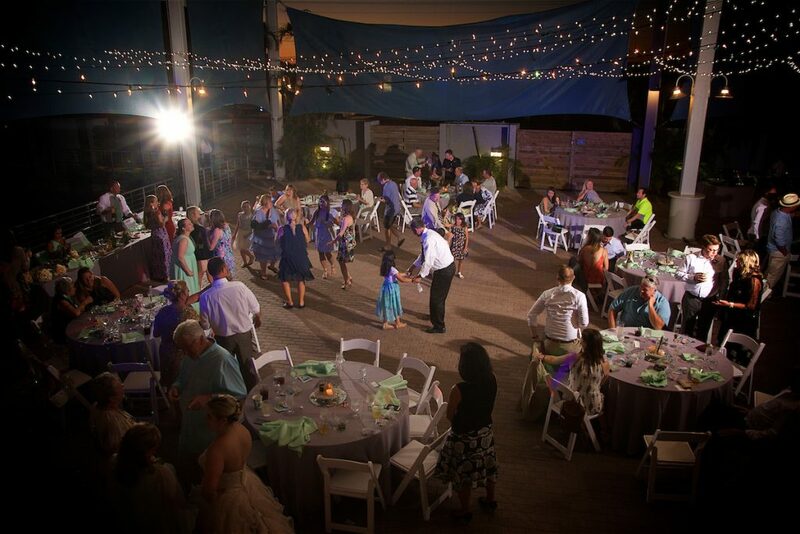 DJ/MC for the evening’s musical entertainment and dancing. 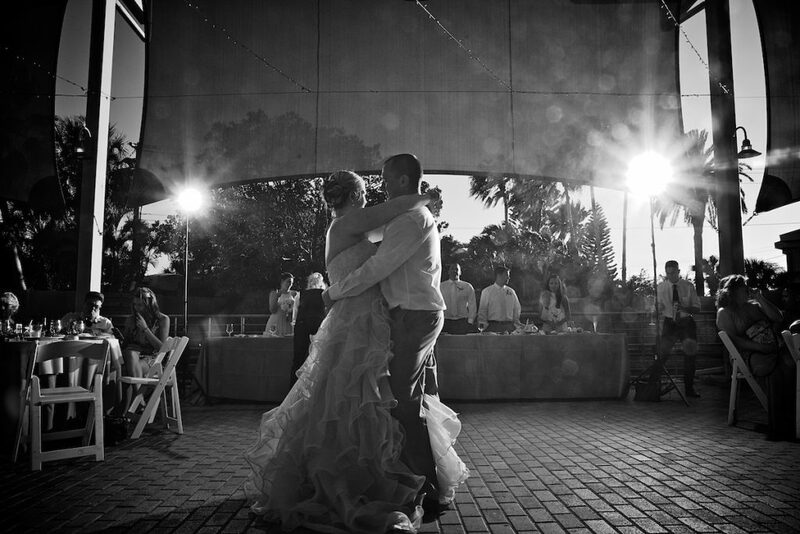 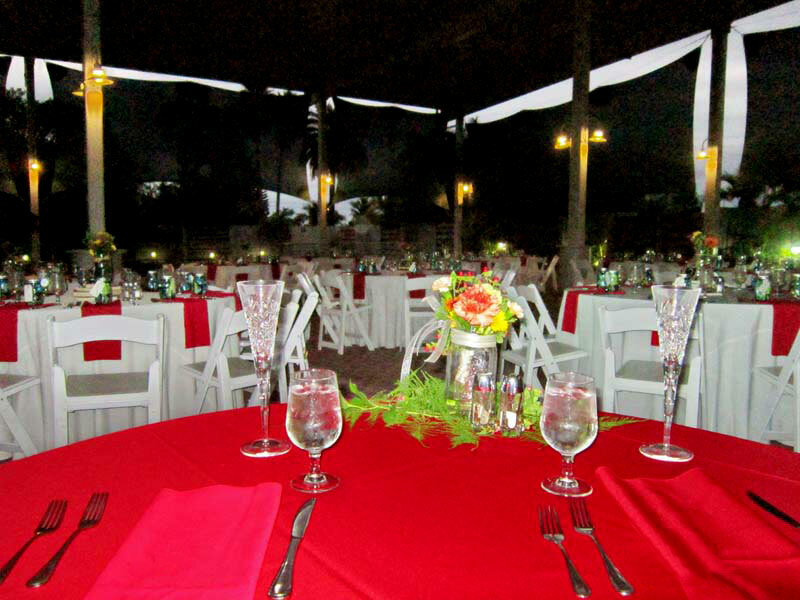 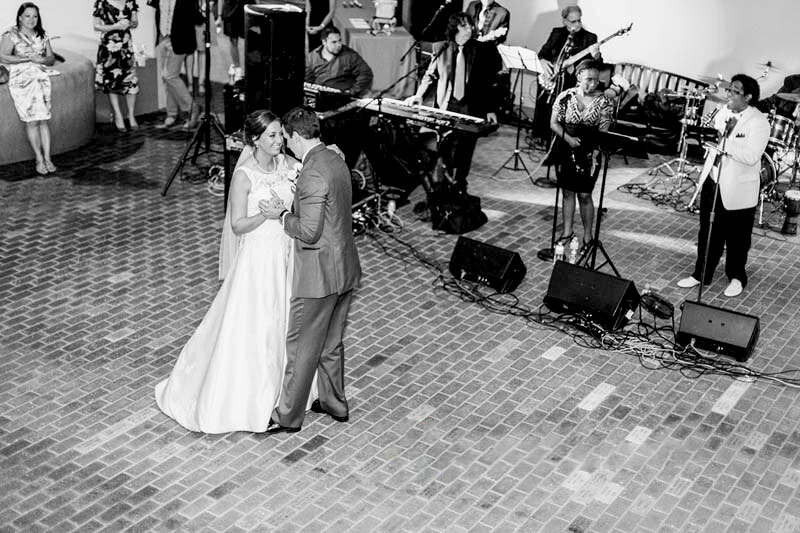 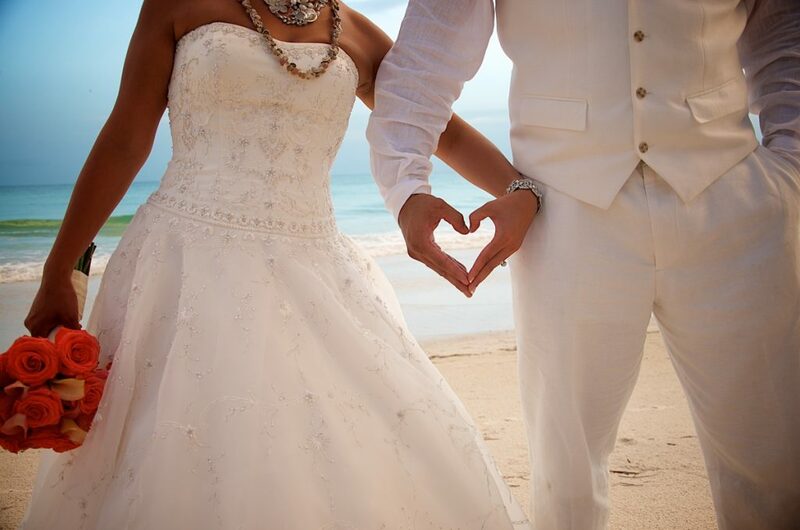 Your choice of music selections, specialty dances, dinner music, dancing, cake cutting, etc. 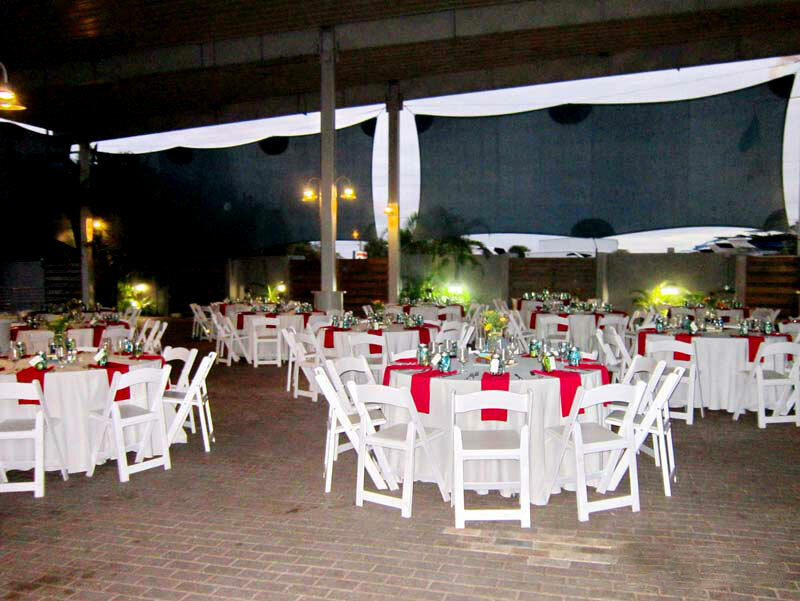 Round tables of eight for guests. 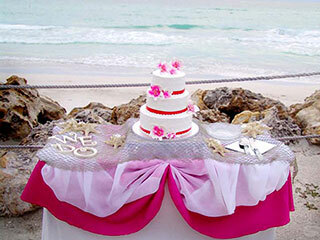 A Sweet Heart table for Bride and Groom. White padded folding chairs, plate ware and flat ware. 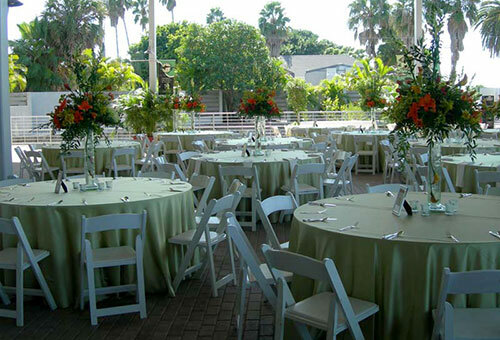 Choice of colored poly/cotton linen tablecloths and colored linen napkins. 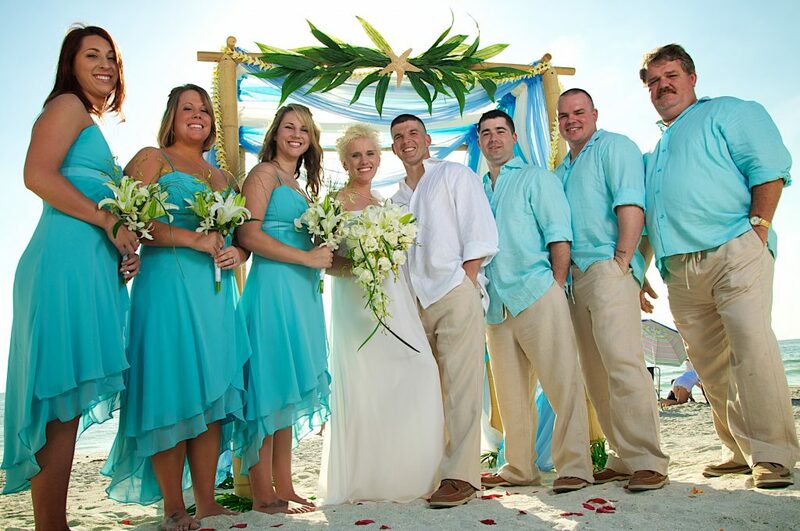 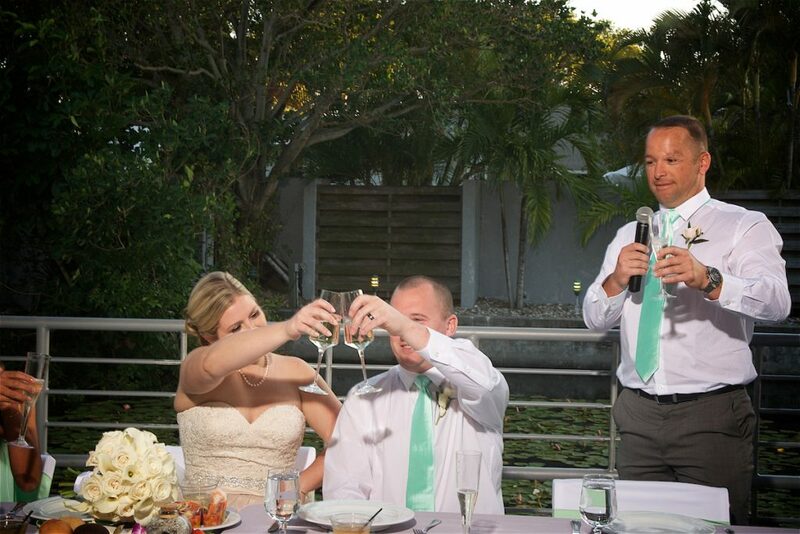 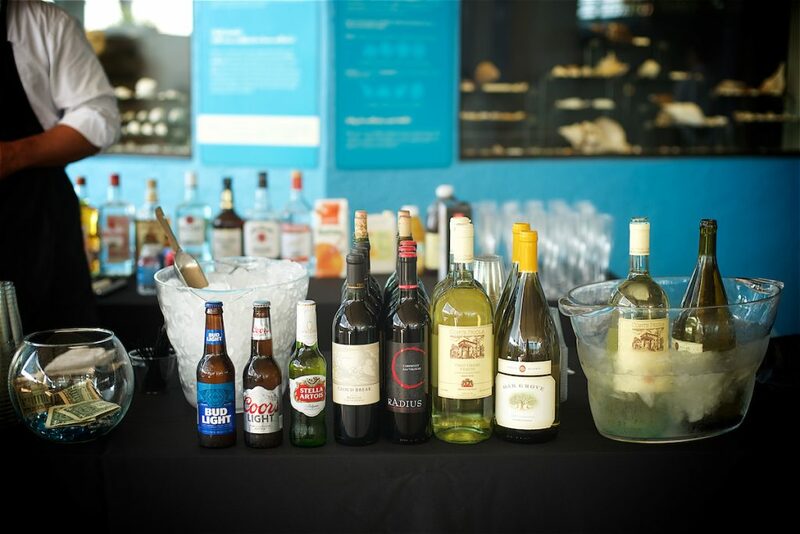 Bride must provide her own alcohol to be served or an open bar can be added at an additional fee. 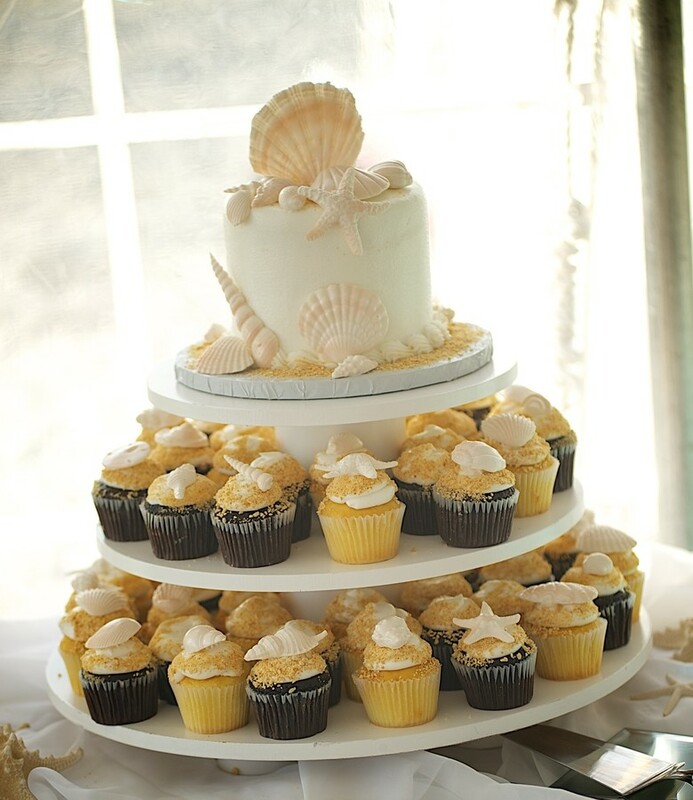 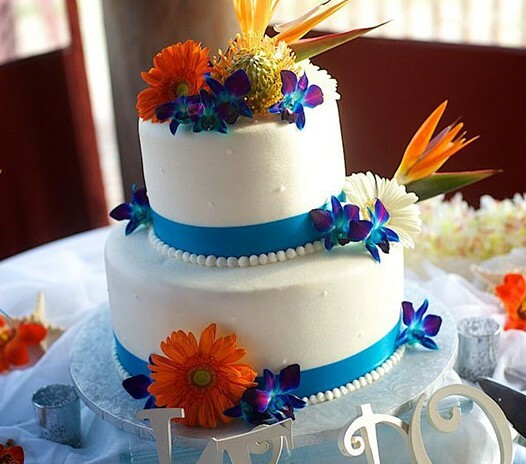 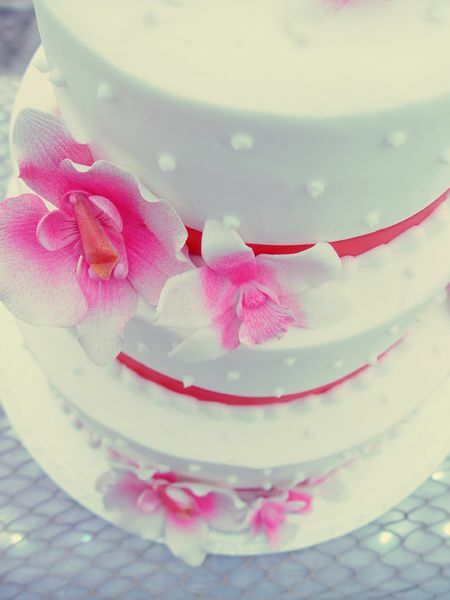 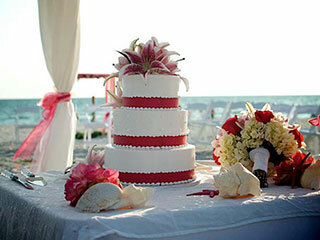 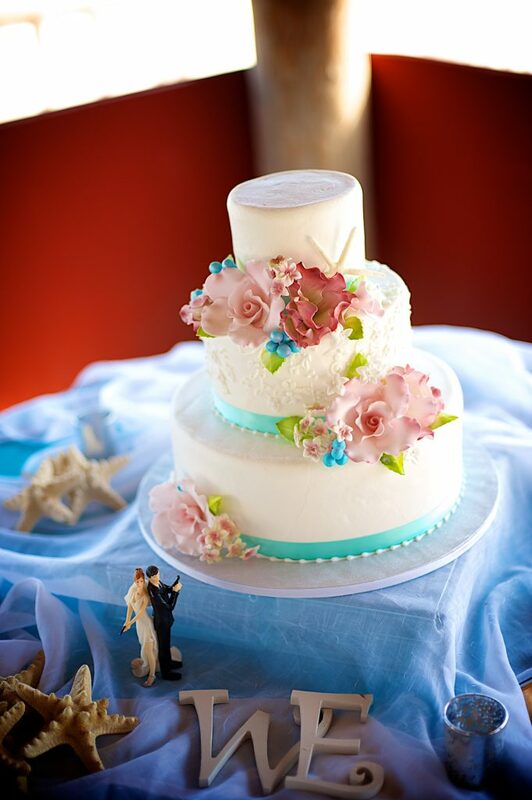 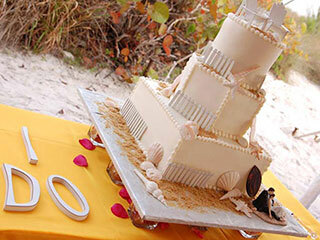 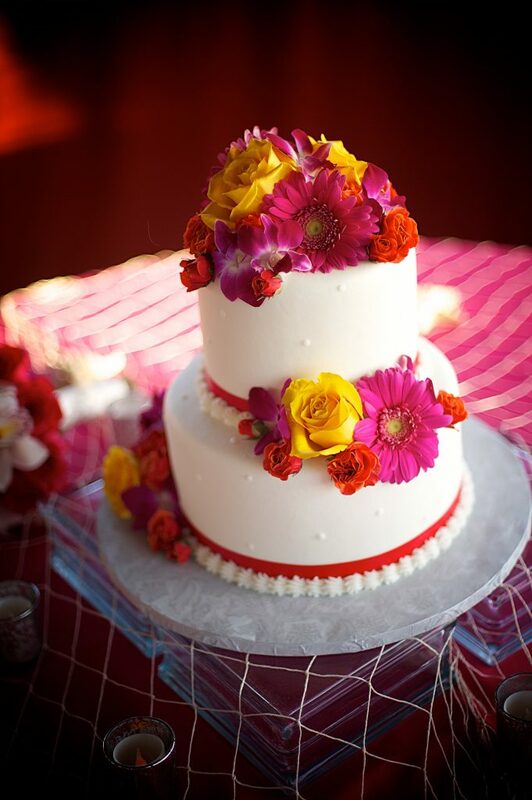 Includes a Wedding Cake or Cupcake tree with a variety of styles, flavors and fillings to choose from. 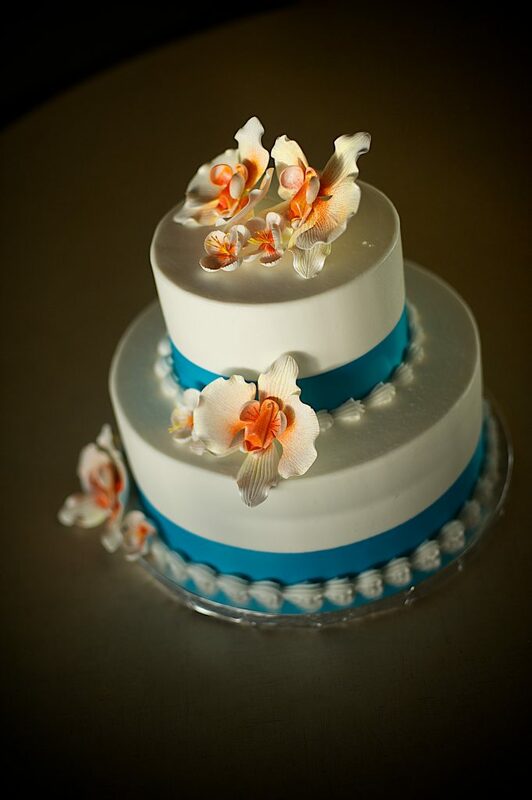 Anniversary cake to take home. 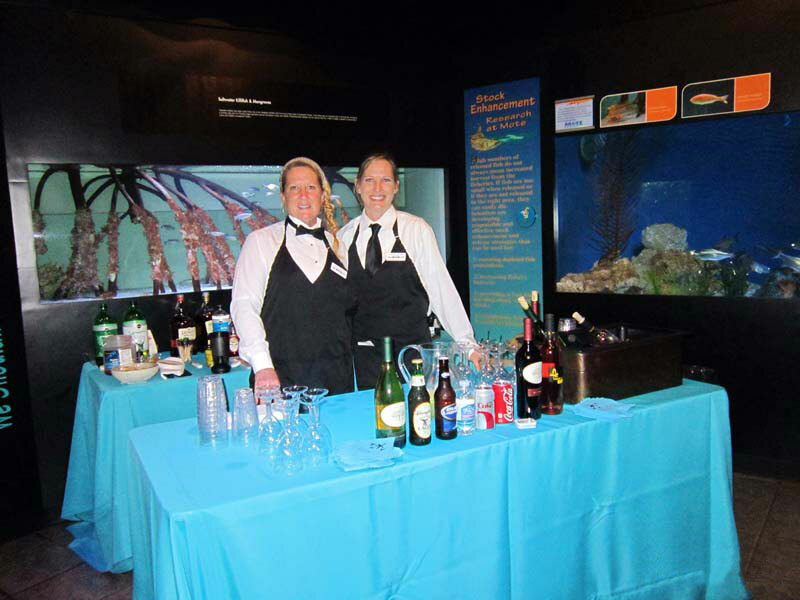 Bartender & limited bartender station included (alcohol must be provided by bride or a bar package added): 1 Bartender for every 75 guests. 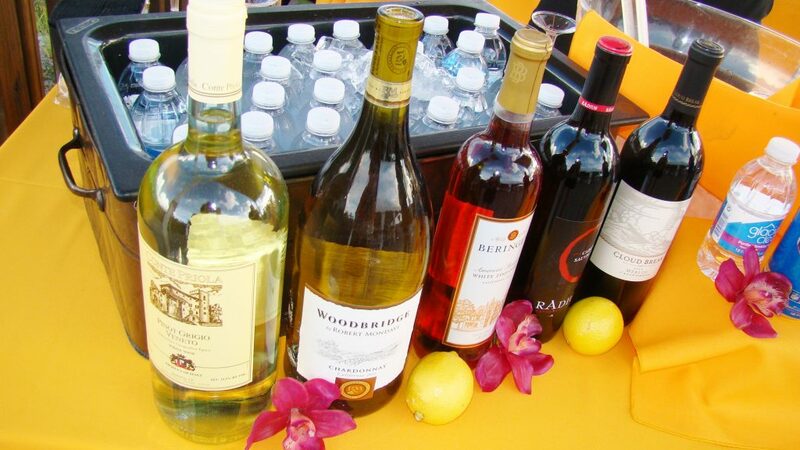 Bar Station for 4 1/2 hours includes: Coke, Diet Coke, Sprite, bottled water, club soda, ginger ale, tonic water, grenadine, dry & sweet vermouth, orange juice, cranberry juice, pineapple juice, cherries, olives, lemon & lime wedges, barware, mixing utensils, ice, disposable cups, stirrers, coolers and beverage napkins. 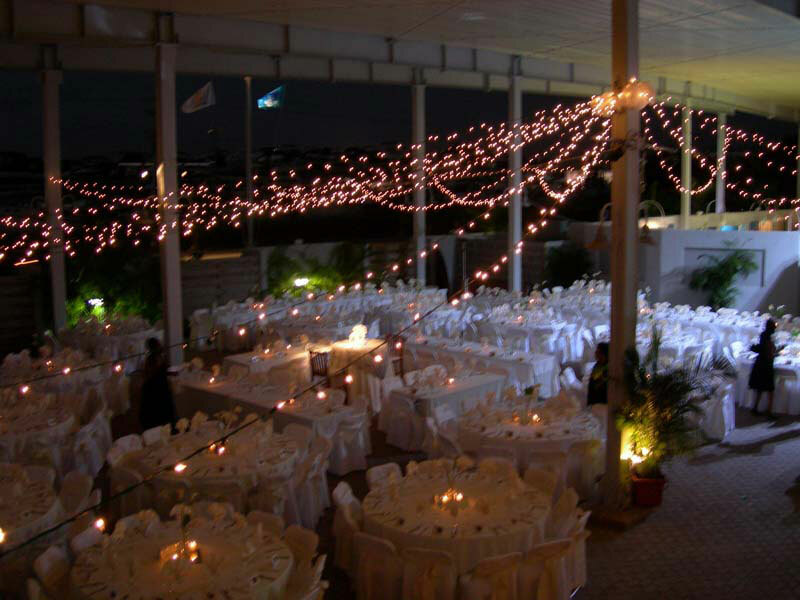 Please Note: Some images below contain specialty lighting not included in this package.